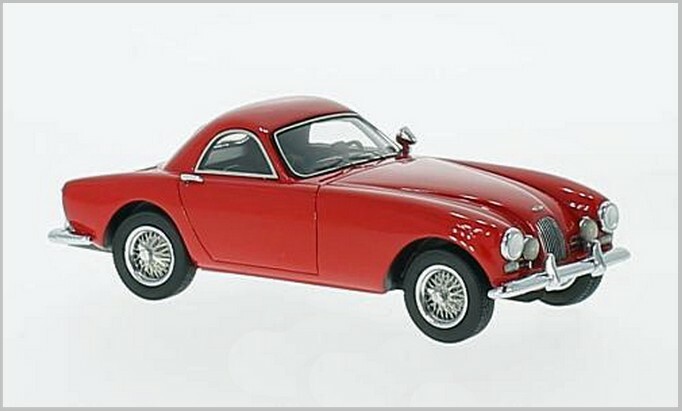 Models from Castline’s M2 1:64 scale Auto-thentics range have appeared in MAR Online from time to time. 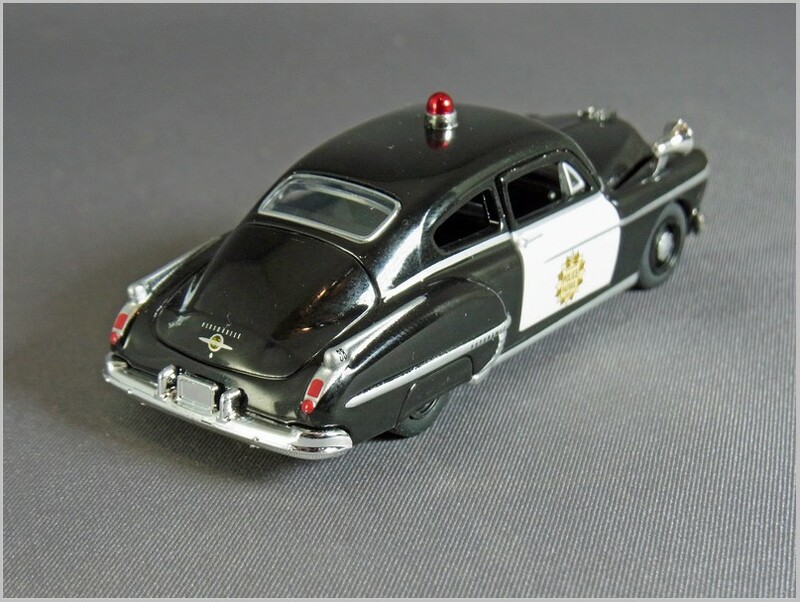 Here we look at their 1950 Oldsmobile 88 in Police livery from Release 45. 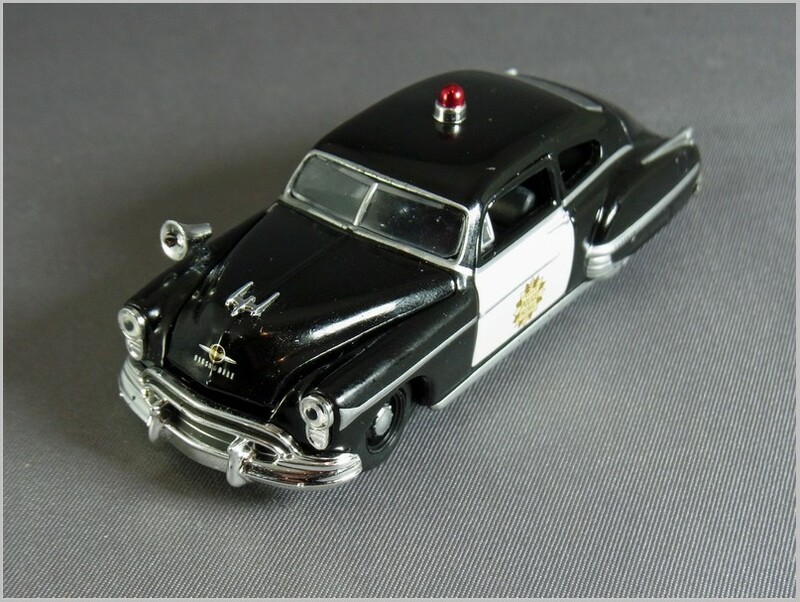 I have been unable to find any evidence that any US Police Force ran Oldsmobile 88s though it is possible that they used a base 88 as that was quite a light body, but reasonably roomy, and was fitted with a V8 that could be supplied in higher police special levels of tune to give it a fleet turn of speed. Maybe a reader can confirm whether they were used or not. 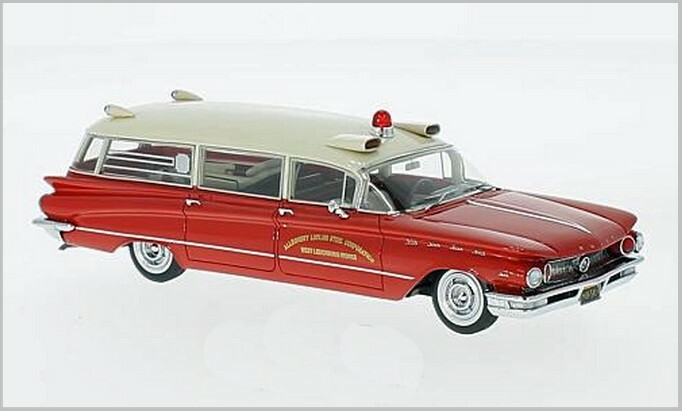 The model has a generic Police Patrol crest as well as white door panels, a red light on the roof and a large siren on the wing. 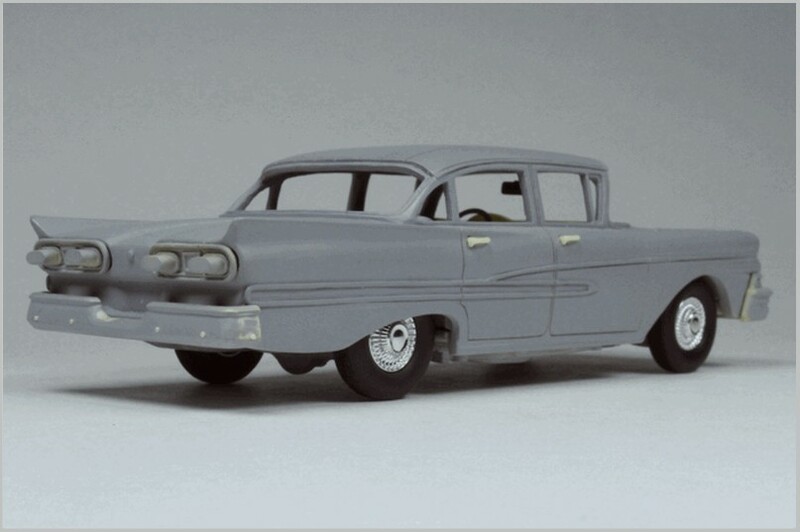 The wheels have been toned right down with a small silver hubcap on black wheels with plain black tires which was the sort of finish used by Police Departments. 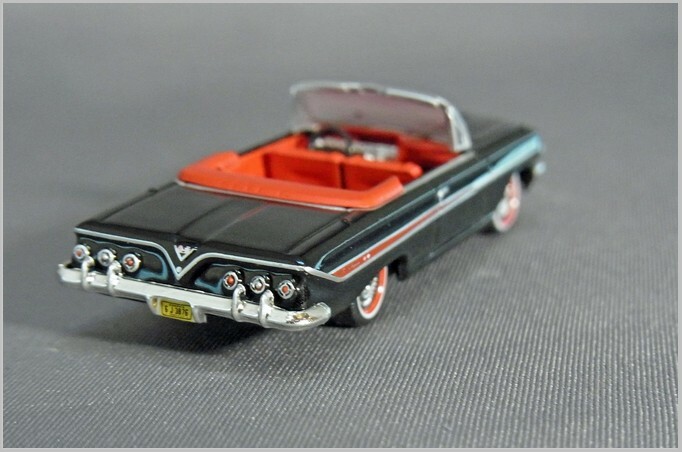 The black 88 body appeared previously in release 23 and it had full size wheel embellishers and white sidewalls. 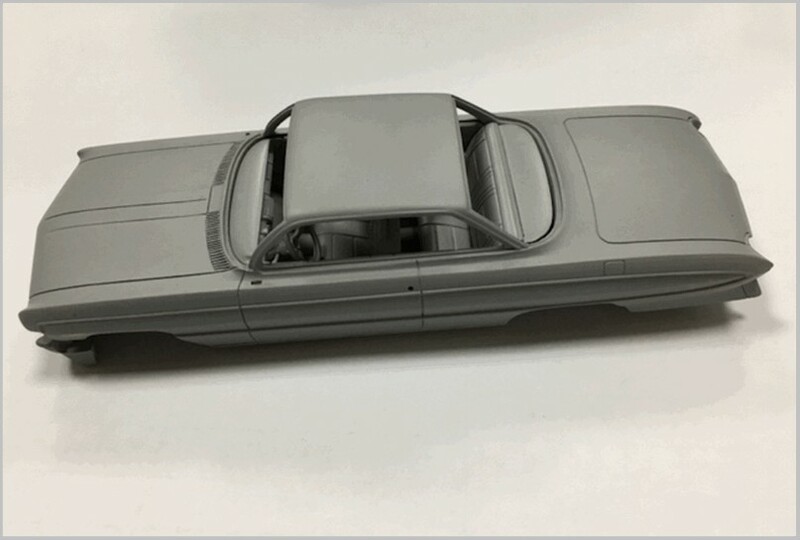 Like most M2 Auto-thentics the car has opening bonnet and doors with the usual wildly overscale hinges which are probably retained due to safety testing requirements. 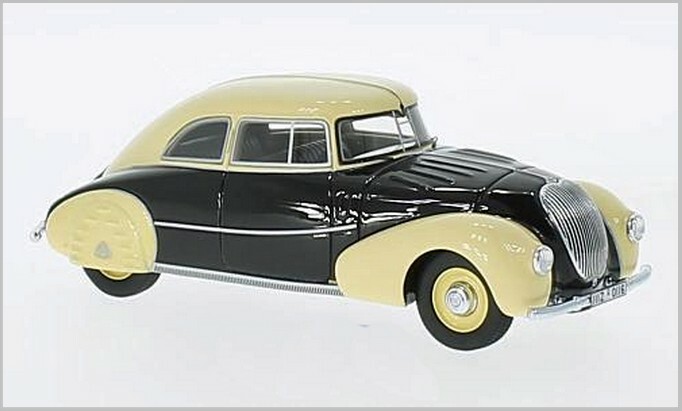 In the early days these often spoilt the models with huge panel gaps but on this car they are fine and as the doors are full framed they look good open or closed. Though the lower door is white in and out and I am not sure how realistic white door cards are. Under the bonnet we find a simple replica of a V8 engine. 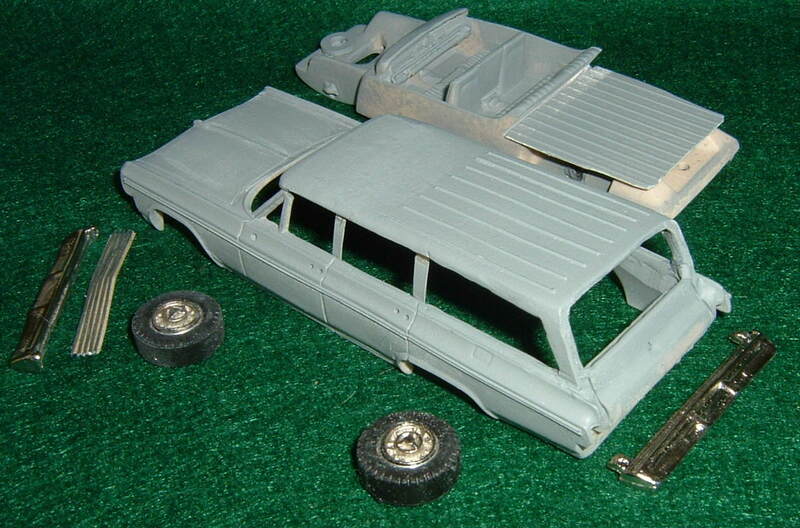 The interior is neatly moulded but has no printed detail. 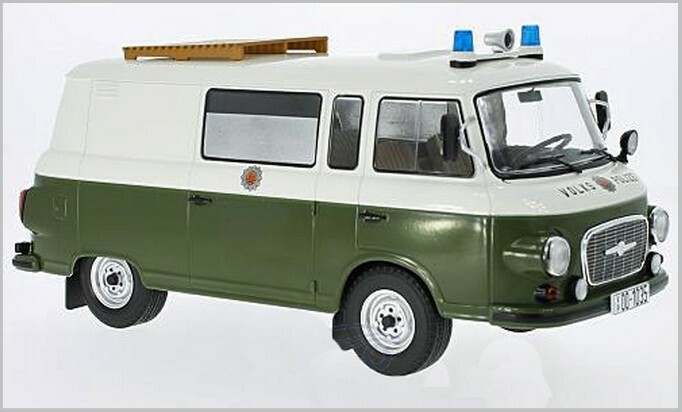 One curiosity is that there are no rear side windows fitted which I would expect to be there and firmly closed in a police car even if the front windows were left open. 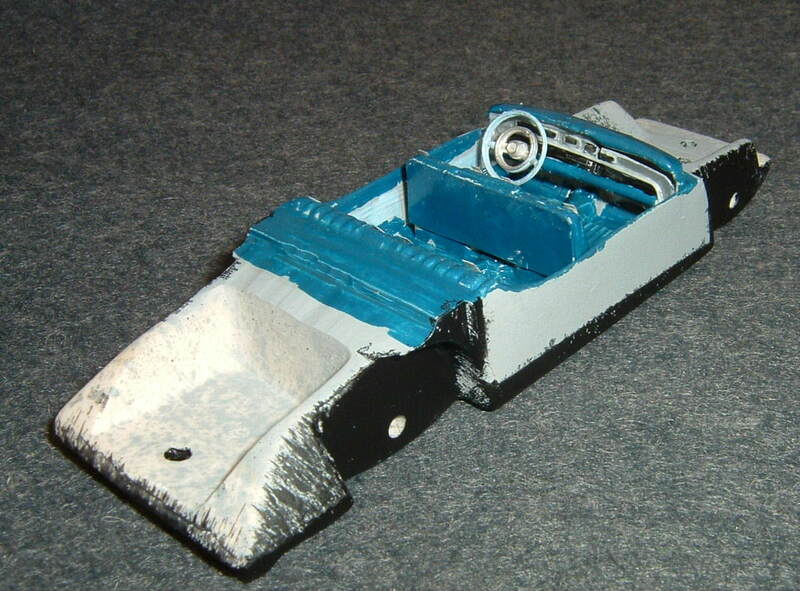 Underneath the base plate has the vestigial chassis details and exhausts, sump and axle all moulded in. 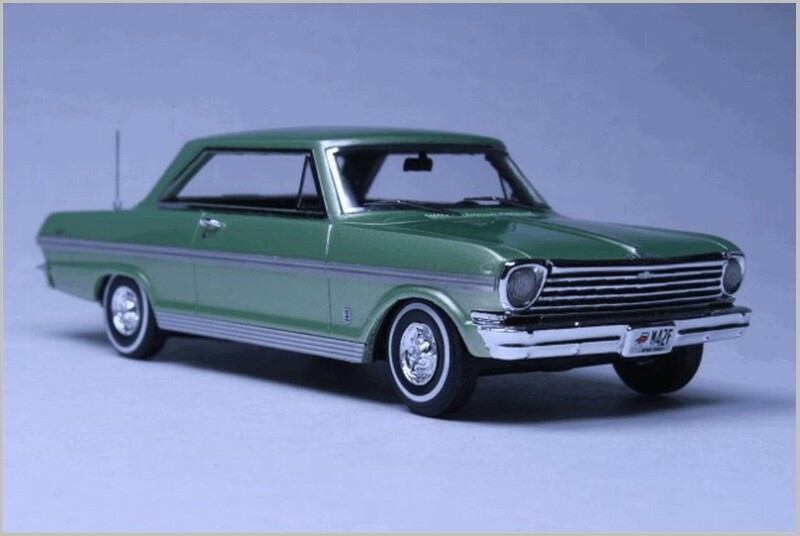 Bumpers, grilles and lights are all well modelled in a way that suits the heavy chrome work of the original vehicle. To the rear the painted rear lights are a good feature as is the printed Oldsmobile name and insignia and the other badging. 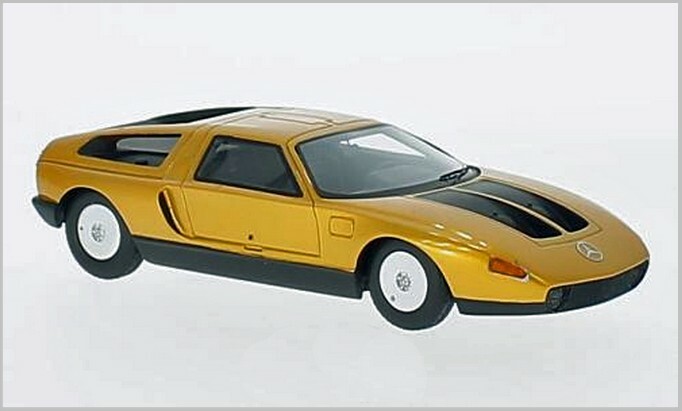 I only noticed the black “88” printed on the strip leading from the rear lights over the wing when looking at the photograph of the car very much enlarged. 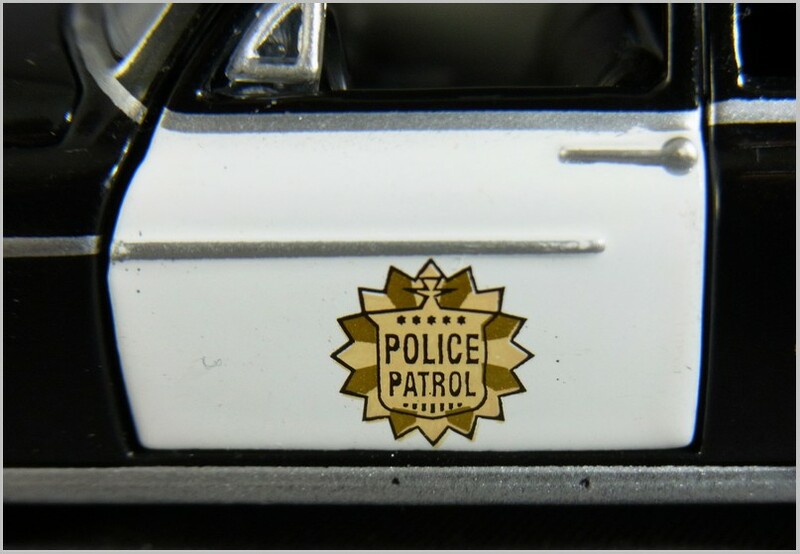 Good to have a Police Car to show alongside all the other M2 models of the early 1950s. 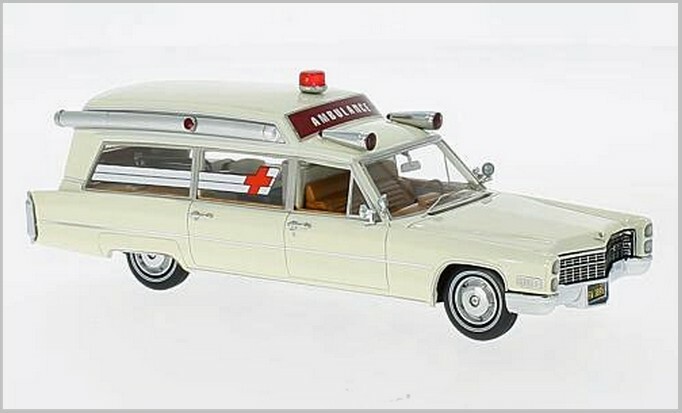 It would be good if M2 look at some more of their castings with an eye on creating some more public service vehicles. 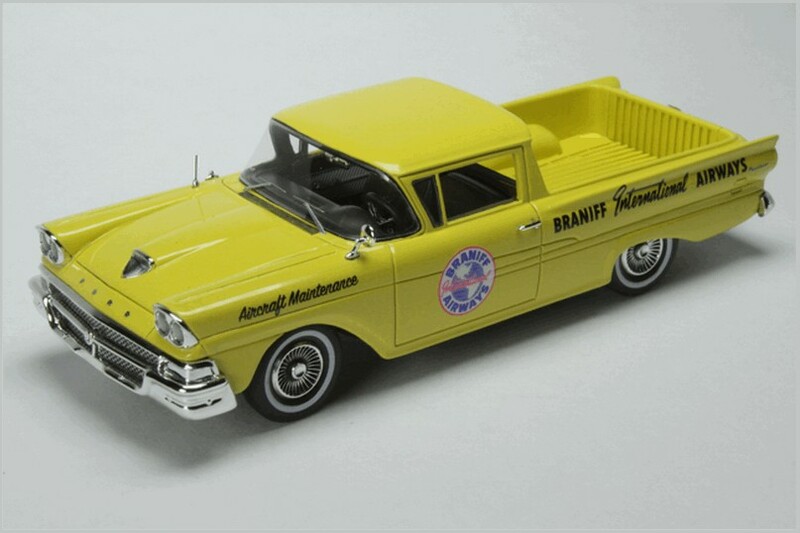 With M2, AutoWorld, and Greenlight all releasing excellent 1:64 scale models collectors of US cars and vans are well-served. All photographs supplied by the Manufacturer. 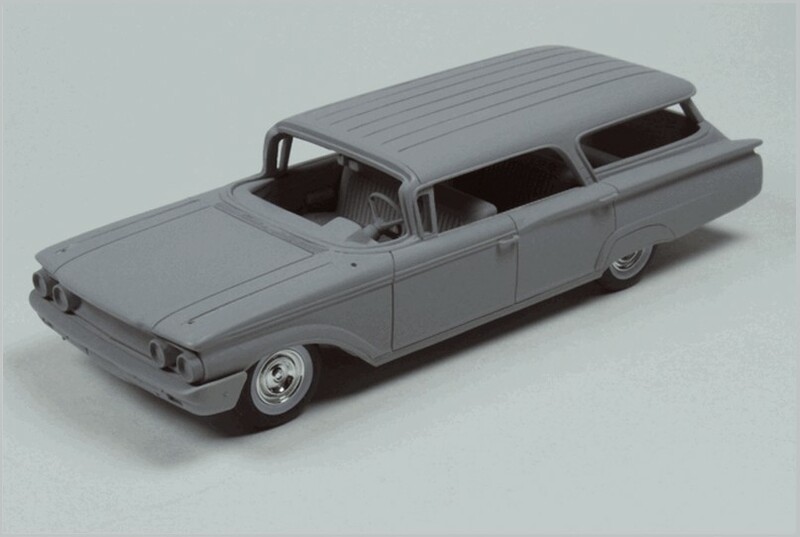 AutoCult has announced three models for release this month. 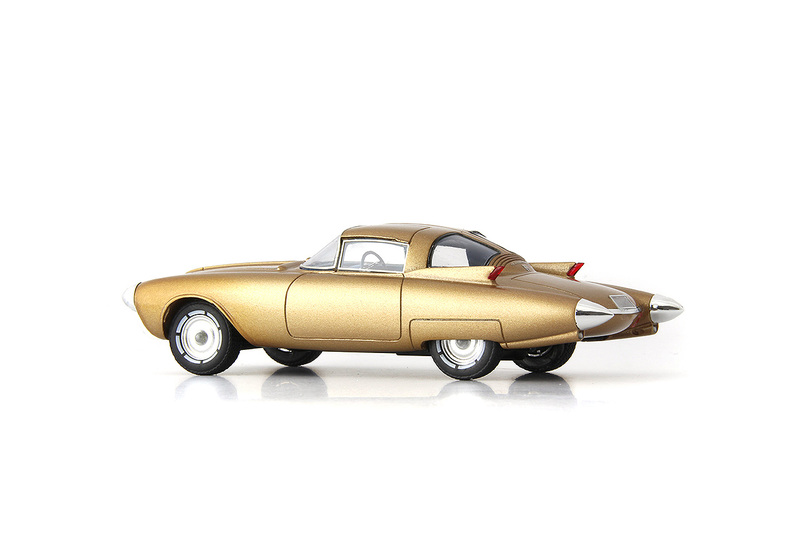 In their series “Prototypes” they model the Oldsmobile Golden Rocket Concept car. 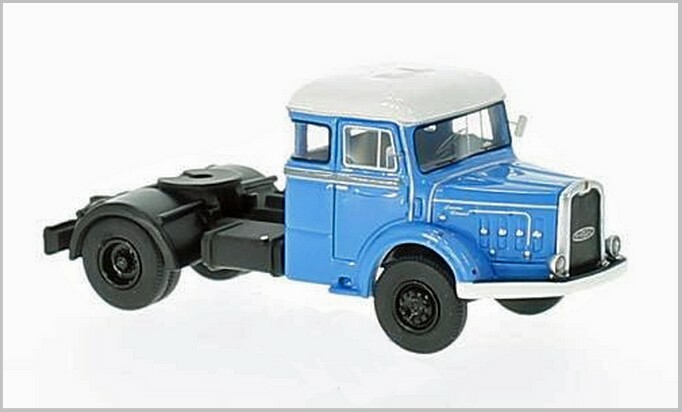 In their series “Delivery Vehicles” they have created the Willys FC-150 Pickup. 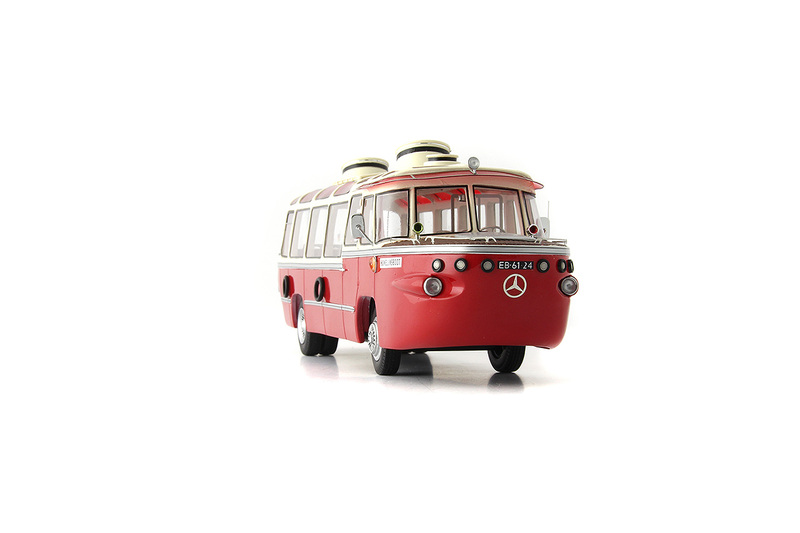 Finally in the series of “Buses” there is a Mercedes-Benz OP312 an Rooijen. 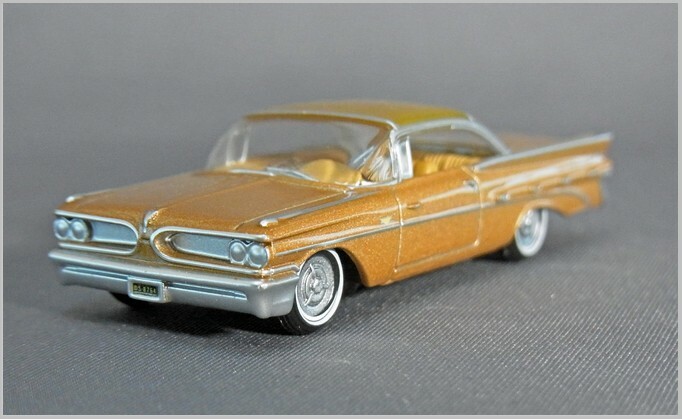 Oldsmobile has been part of General Motors since 1908. 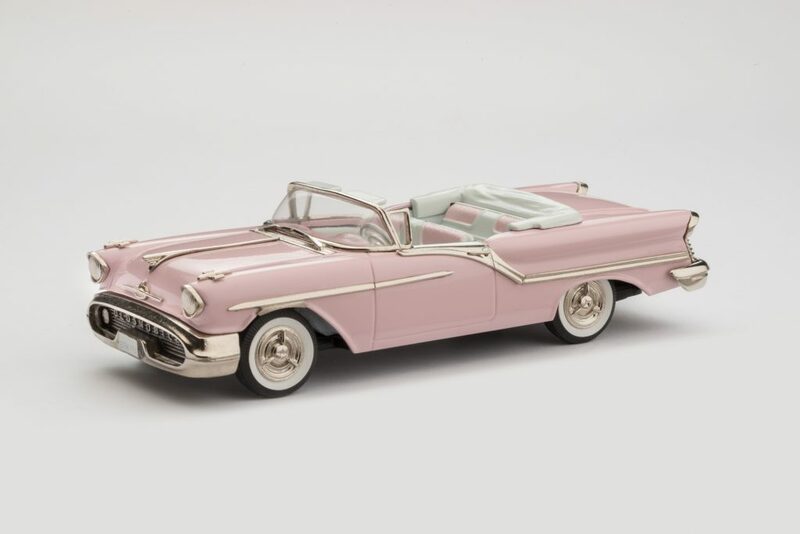 In the 1950s their designs came from the department headed by Harley J. Earl. 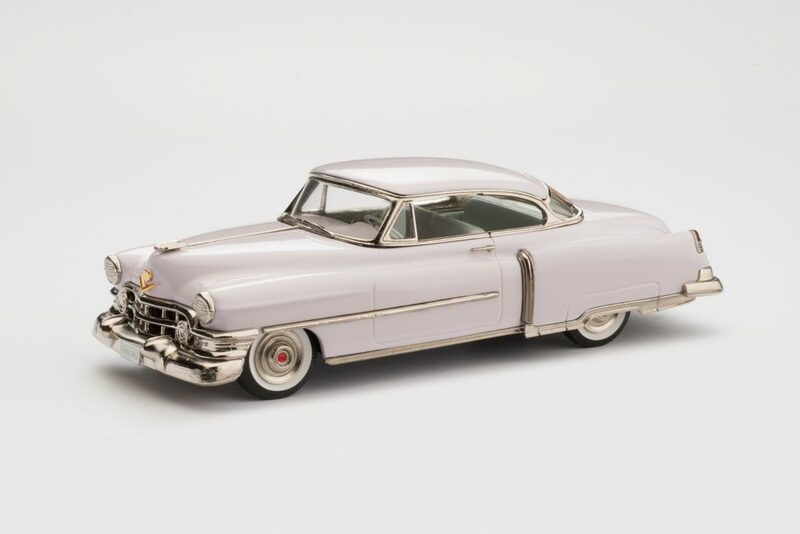 It was the time of the “space race” and the futuristic influence of rocket shapes was felt in the concept cars made by all the big US car makers. 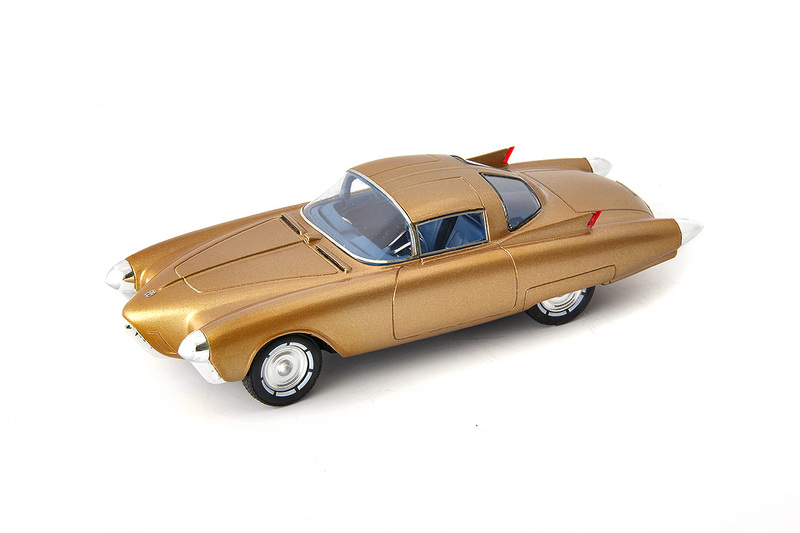 The car modelled by Auto Cult is an Oldsmobile made specially for the 1956 General Motors Motorama, a show where GM showed off concept cars in a bid to attract visitors who could be persuaded to buy their latest production cars which were also on show. 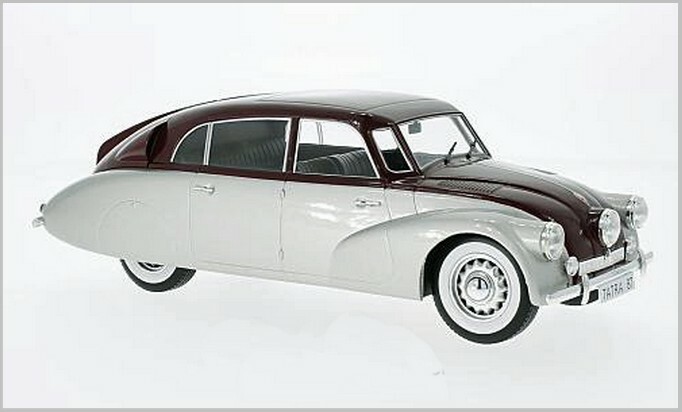 Its split rear screen and thrusting wings and light bearing winglets were to be seen on production cars in the future. 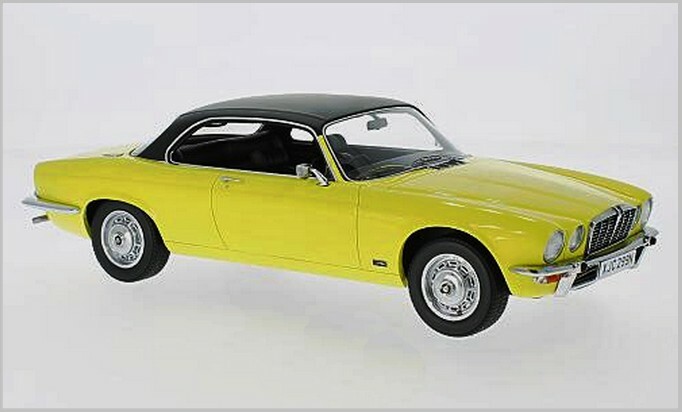 The car body was made in fibreglass and it was fitted with a V8 engine with 275 hp. 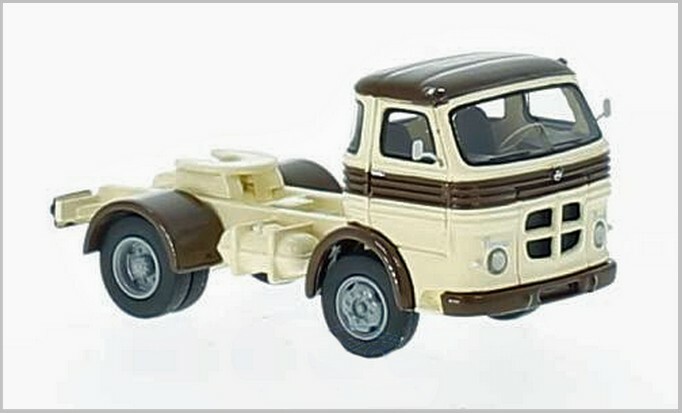 By the mid-1950s the WIllys range looked rather old-fashioned and so Willys planned the launch of a new delivery truck with a new and striking design. The management brought in the well-known designer Brooks Stevens. Stevens’ concept was influenced by the design of heavy-duty trucks. The engine was positioned right underneath the driver’s cab. 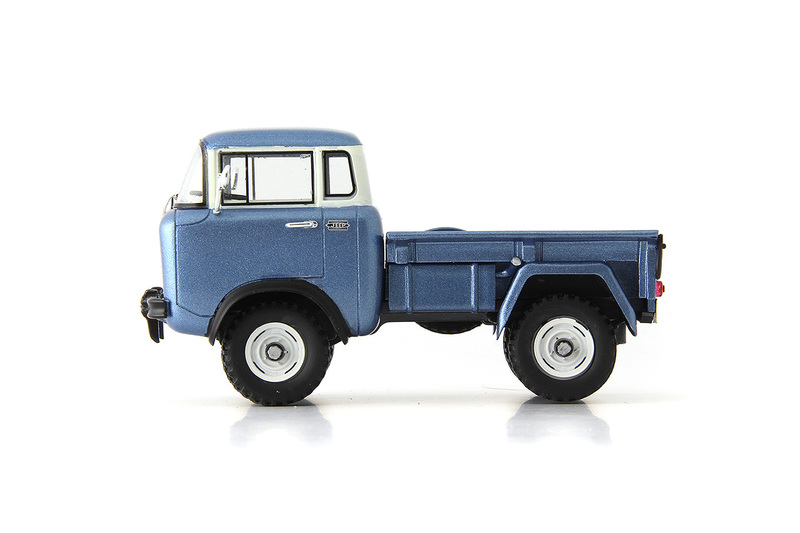 Due to its cab over engine design the delivery truck got the designation “Jeep-Forward-Control”, or “FC” for short. 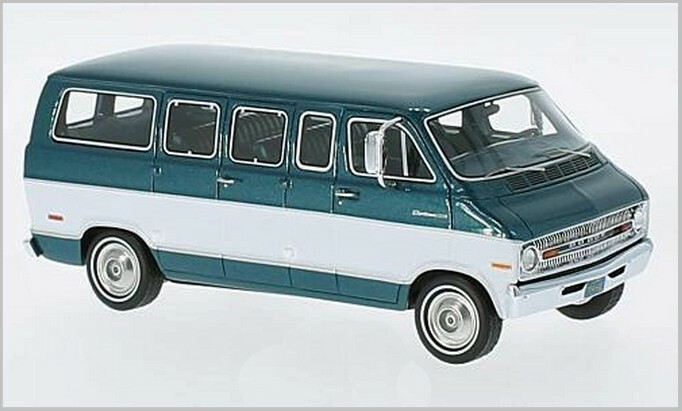 It did not need a long development phase to get the van into production as parts like the chassis and the engine were already in in use. 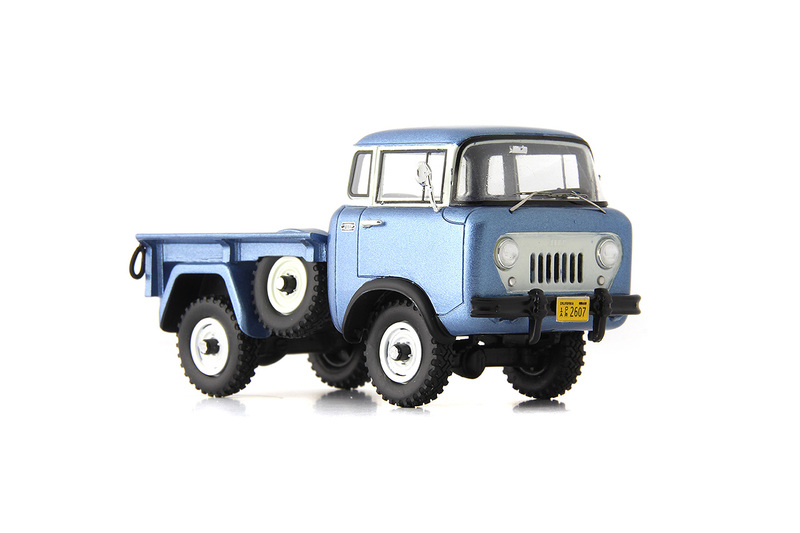 The chassis came from the in-house 1954 SUV “CJ-5” and the engine was the “Hurricane” type. 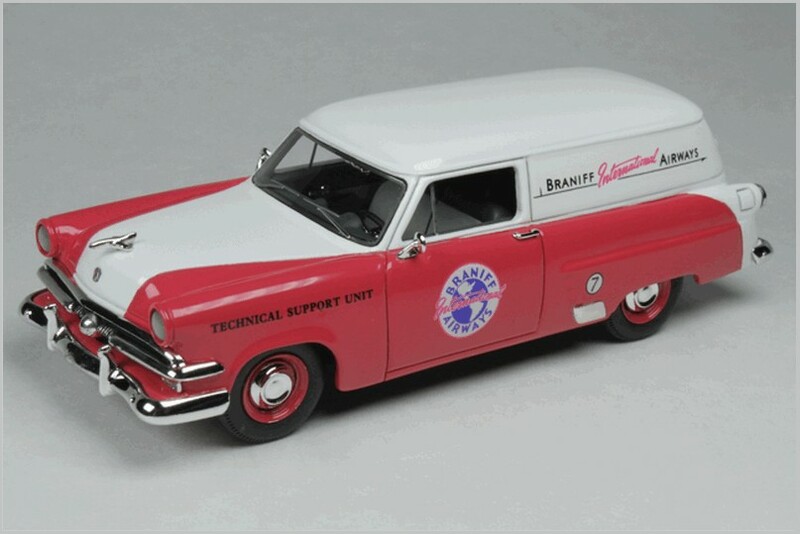 On November 29, 1956, the first of these vehicles were presented at a special event for dealers. 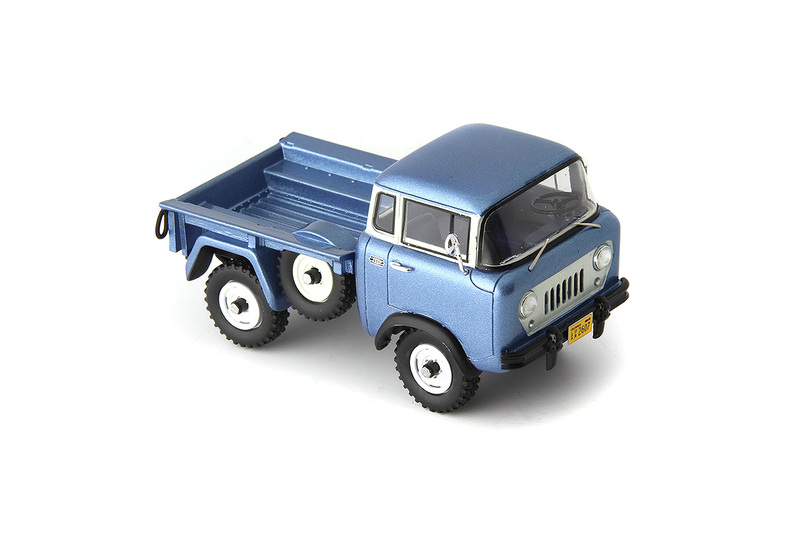 The wheelbase of the small delivery truck was strikingly short at just two meters. It also had a small turning circle. But, the narrow width of only 1.2 metres gave it undesirable handling traits. Two years later this was addressed by broadening the truck to 1.4 metres whilst retaining the same load bed length. 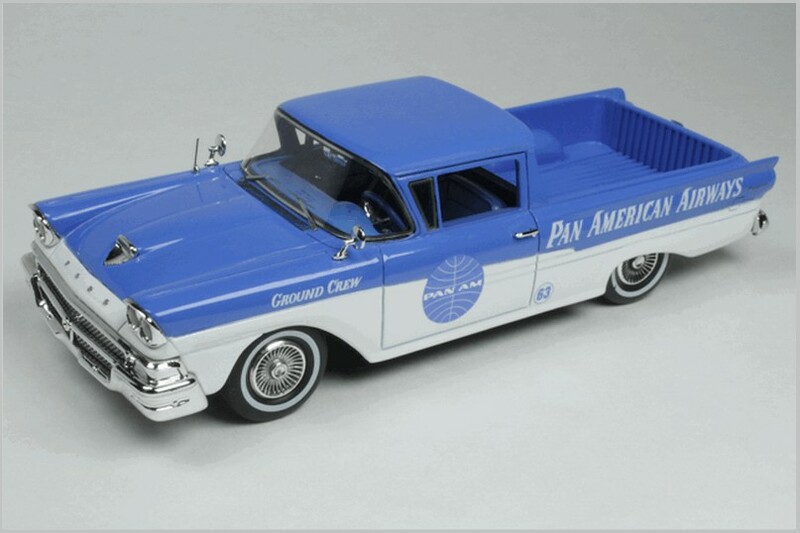 Altogether the production of this style of truck lasted from 1957 to 1964. 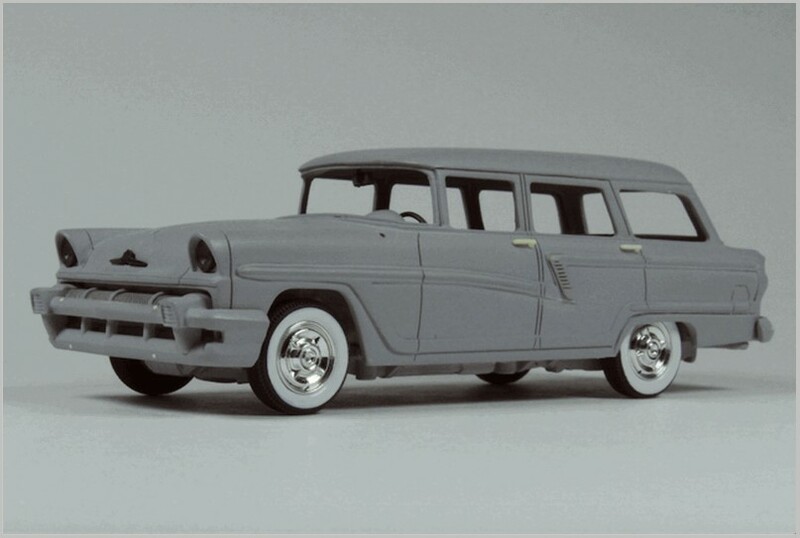 All variations added together sold no more than 30,000 units which was considerably less than Willys had hoped. The DUKW has inspired many vehicles. 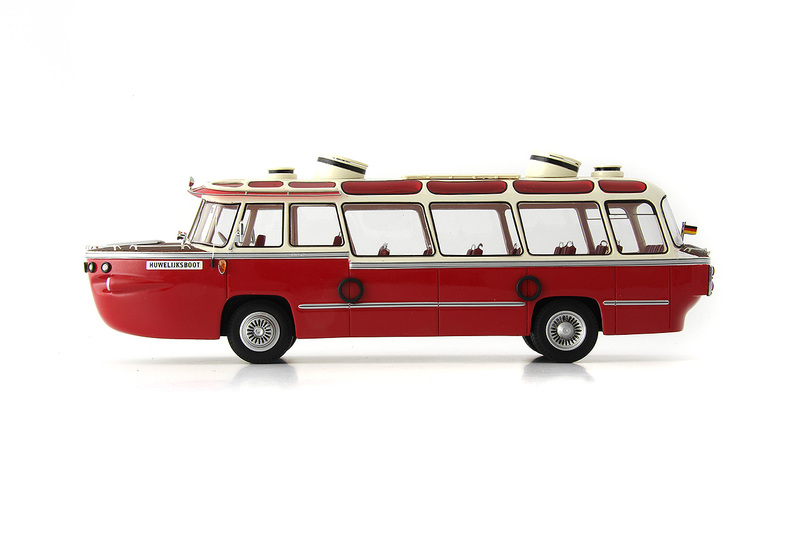 Some built buses looking like boats and some built ones that could also perform as one. Tours are available in Prague today in a bus-boat based on a modern coach which is amphibious. 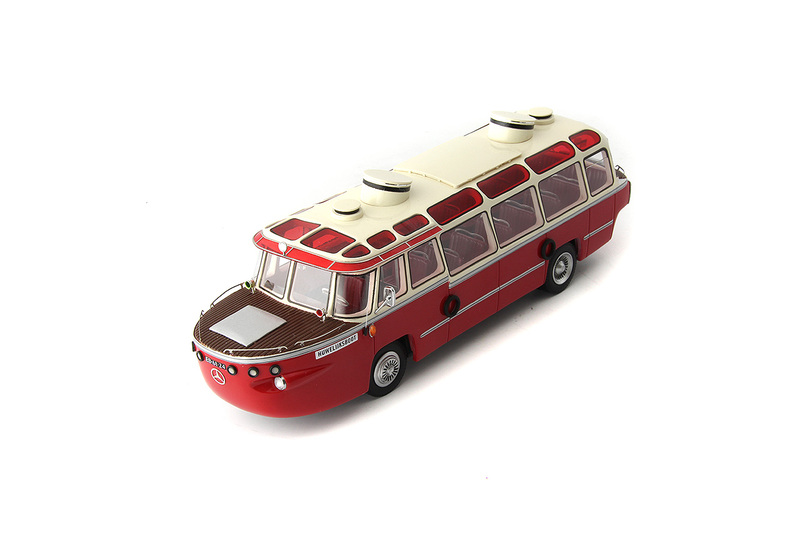 But the bus modelled by Auto Cult was based on a series of buses inspired by the style of boats but which could not travel in water. 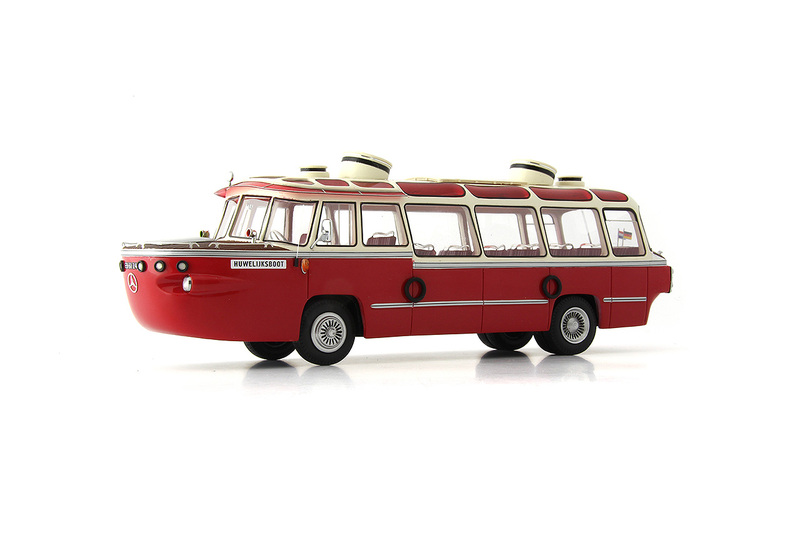 This special boat-bus, named `Huwelijksboot’ (Dutch for wedding boat), was one of three identical vehicles. 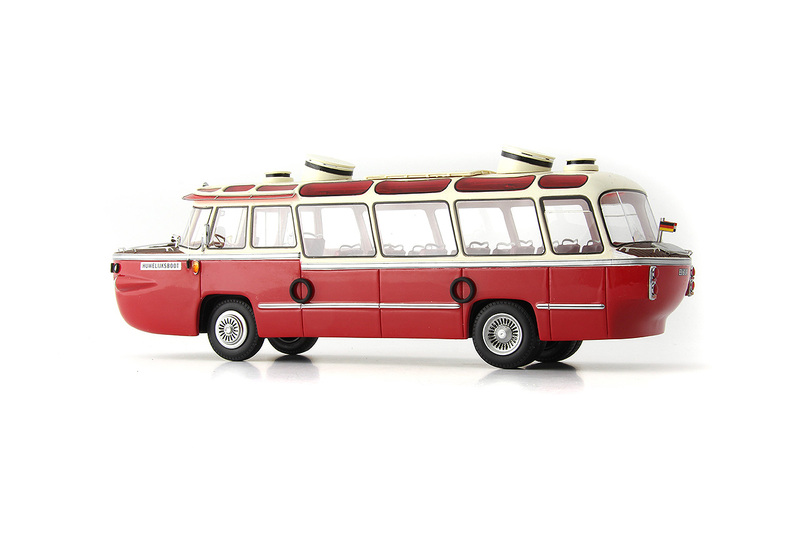 All three buses were built by the body maker van Rooijen in the 1950s. 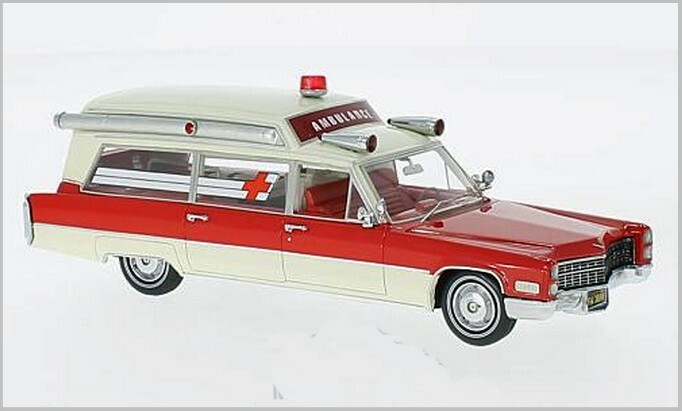 The body maker was based in Montfort (Netherlands). 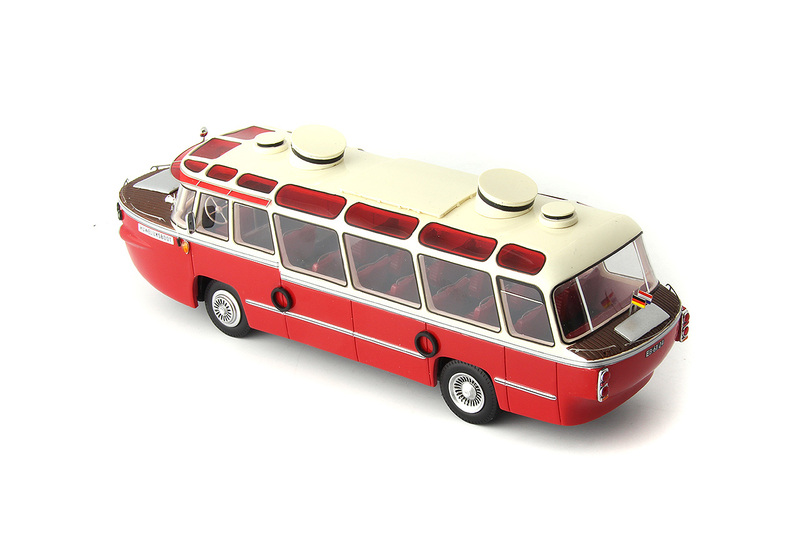 The buses were styled to look boat shaped and fitted with wood and railings and even funnels to make it look the part. There were even tyres on the vehicles ship’s side just like the ones used to protect a normal boat as it landed at a pier. All three boat-buses were built on the chassis of a Mercedes-Benz OP 312, had an engine with a performance of 120 hp, and offered space for 32 passengers. 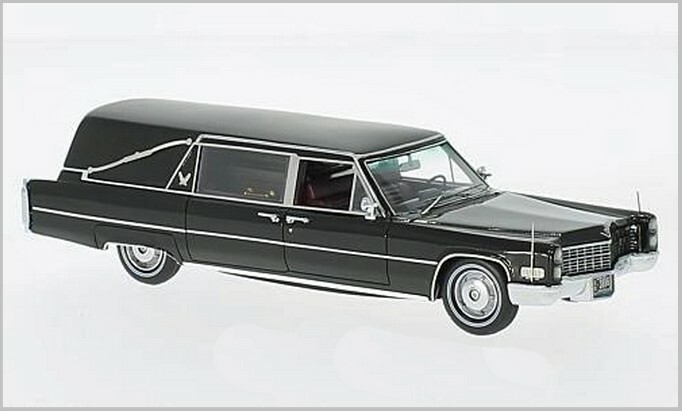 These vehicles provided a comfortable ride with a special style. All photographs taken by, and copyright of the Author. 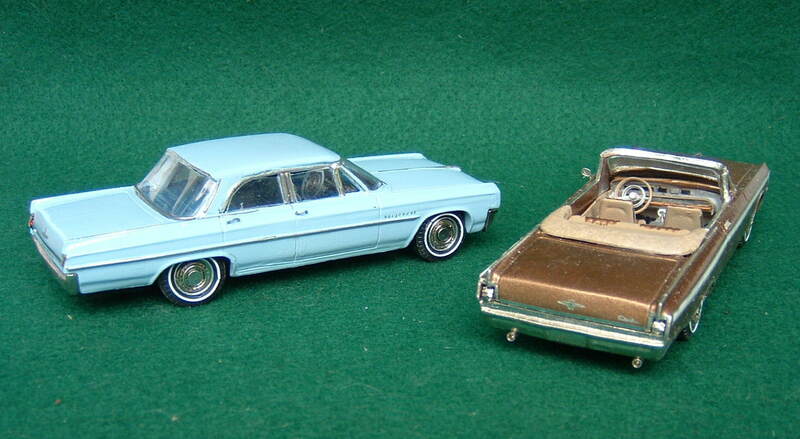 Regular readers may remember my criticisms of the last release of 1:87 scale American subjects by Oxford Diecast. It wasn’t that they were bad models it was just that some details were not finished correctly and the models could have been much better. If you wish to refresh your memory of the shortcomings click here. 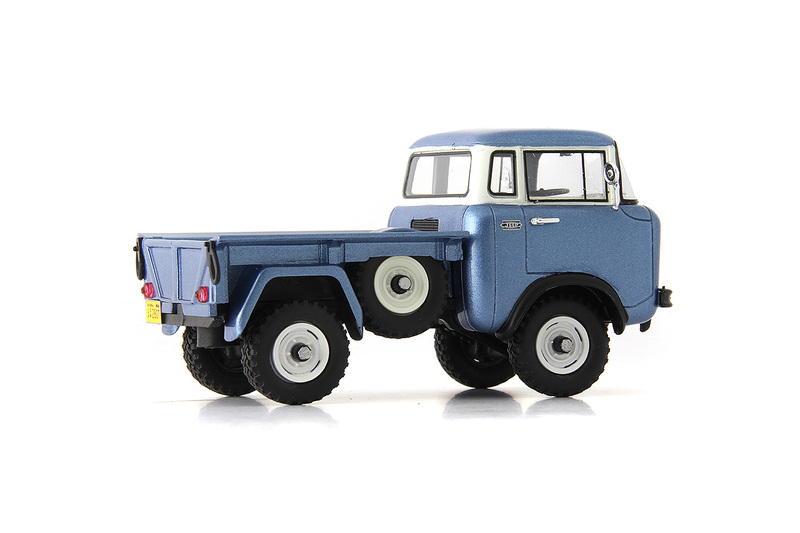 This time round I am happy to say that the latest release of new castings are impressive and very good value for money here in the UK. There are a few minor details that could be better but overall these are as close to excellent as I would expect for the price point. 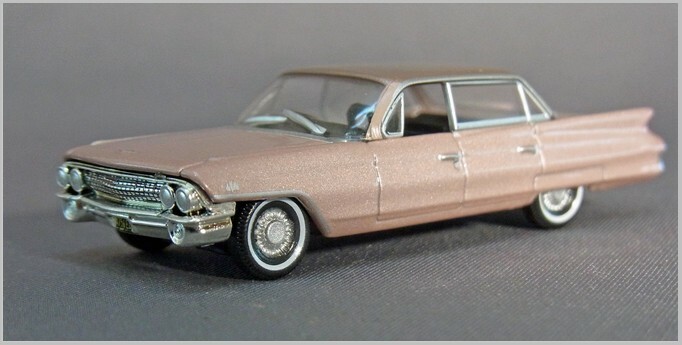 All the models in this release are licensed by General Motors. 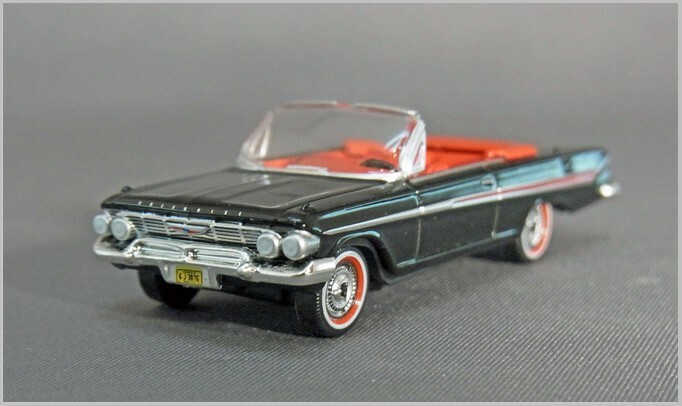 87CI61001 Chevrolet Impala 1961 Convertible. 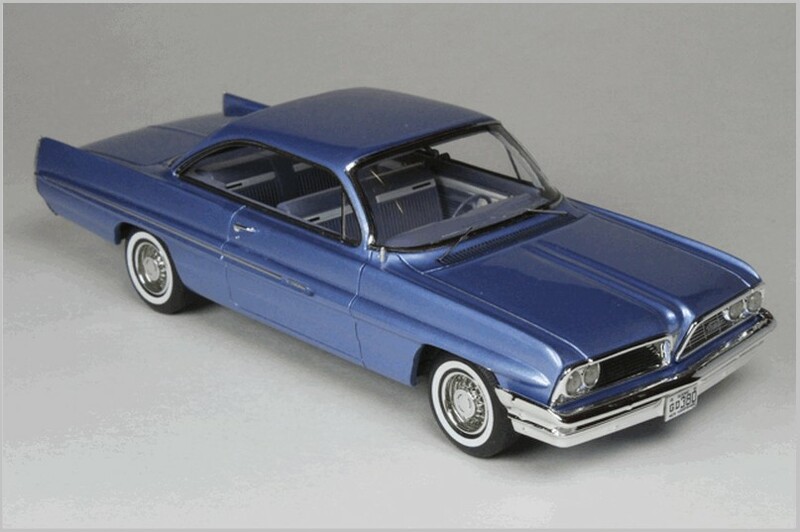 The third generation of the Chevrolet Impala was considerably less flamboyant than the previous generations. 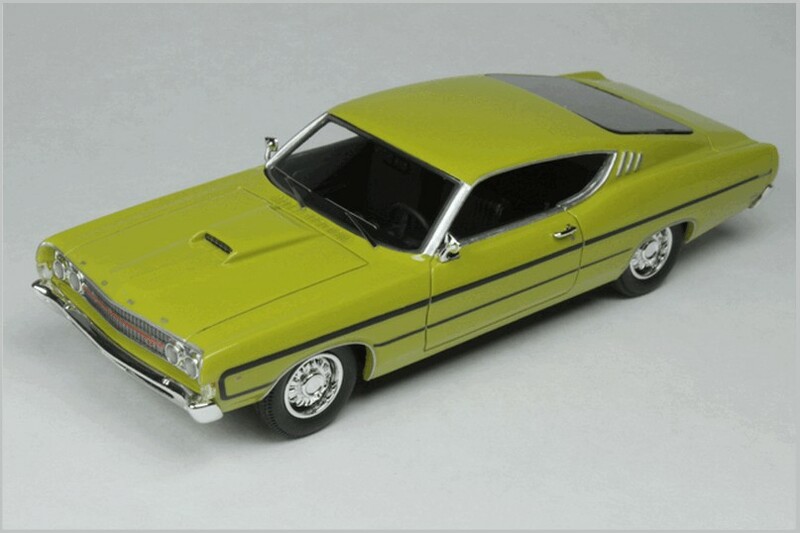 US cars were going through a period of transformation as the fins retreated and squarer body styling gradually asserted itself. 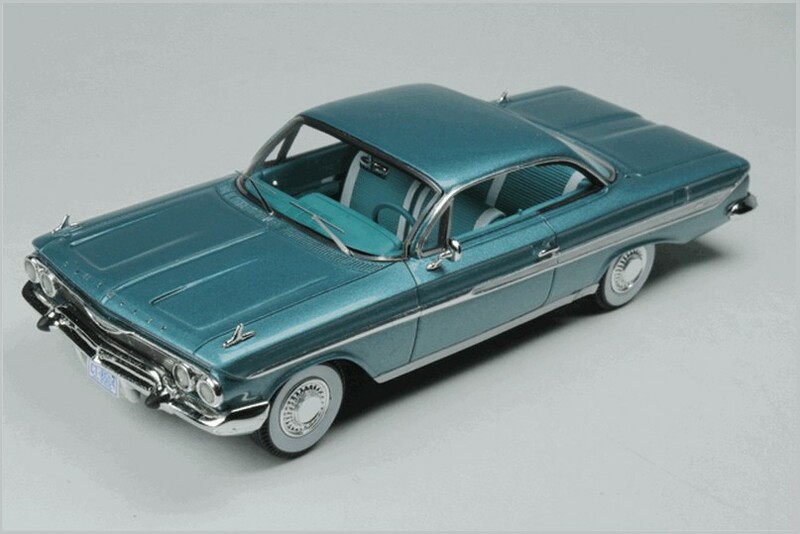 The 1961 Impala was based upon the GM B platform and could be bought with a 3.8 Litre Straight six or a range of V8s from 4.6 Litres to 6.7 Litres. 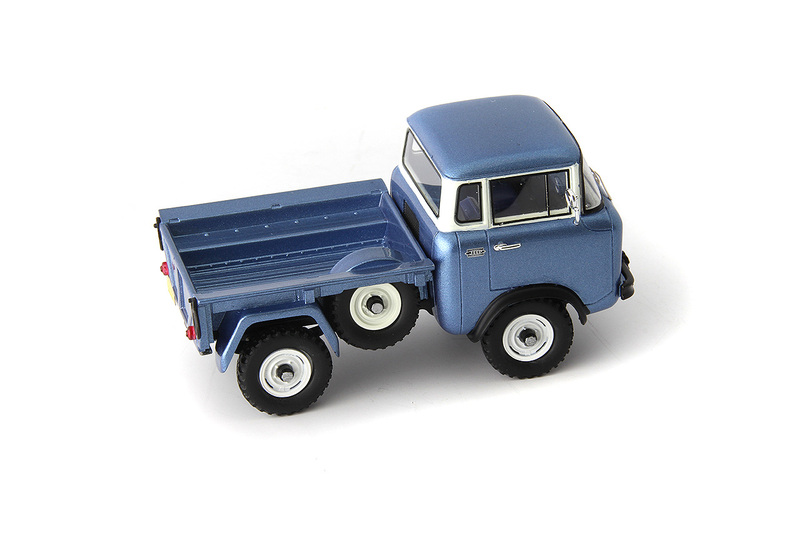 The Oxford model is excellent with really fine printing of badging and number plates. 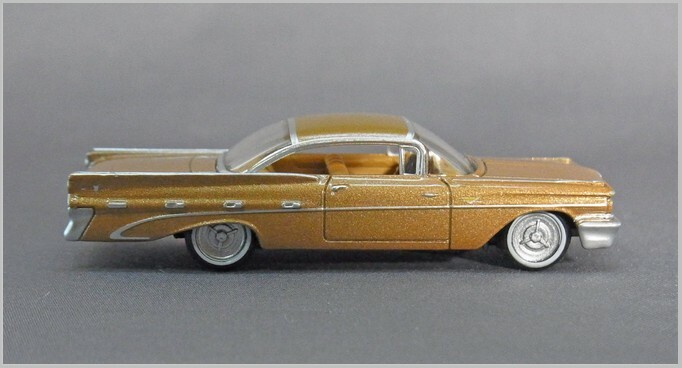 The wheels capture the real ones excellently with the correct narrower whitewalls and the elaborate wheel covers. 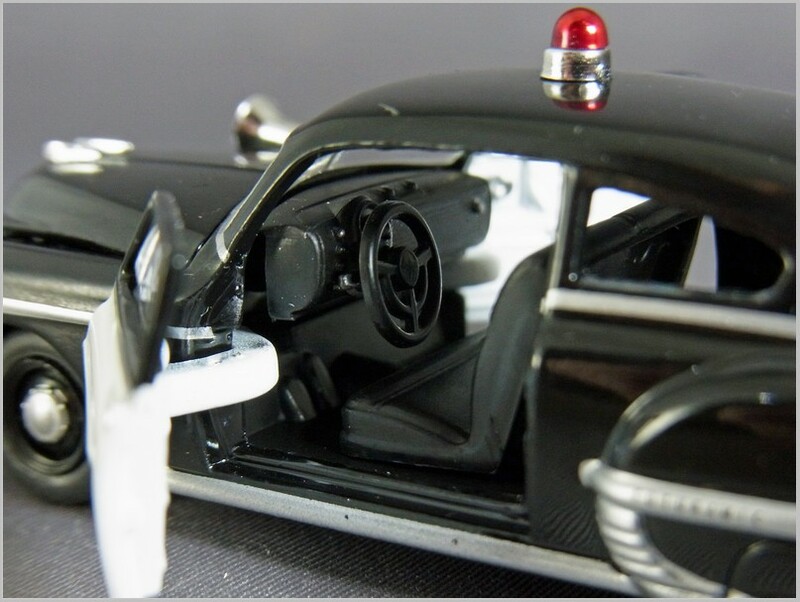 Inside the chromed dashboard has been moulded and picked out. 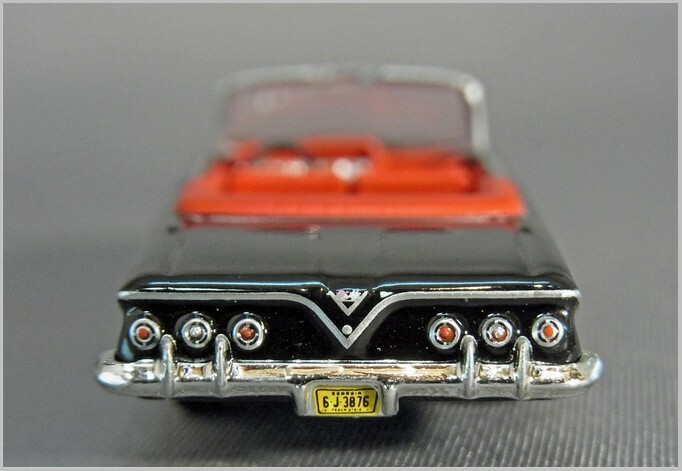 The rear lights have been cast in well and are neatly picked out. In the photographs you can see that even the button to open the boot has been printed on. 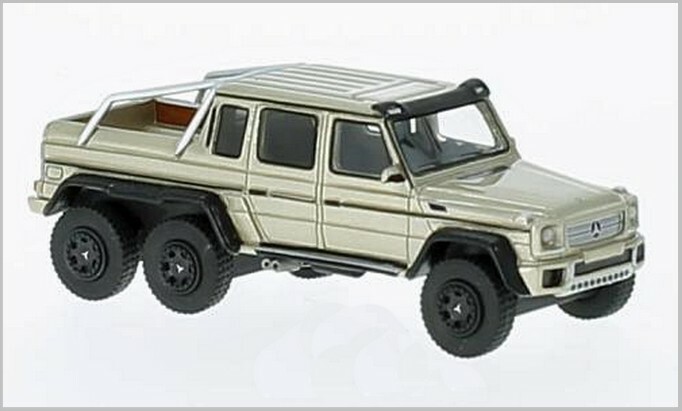 All these models have the chassis moulded in some detail for their size. 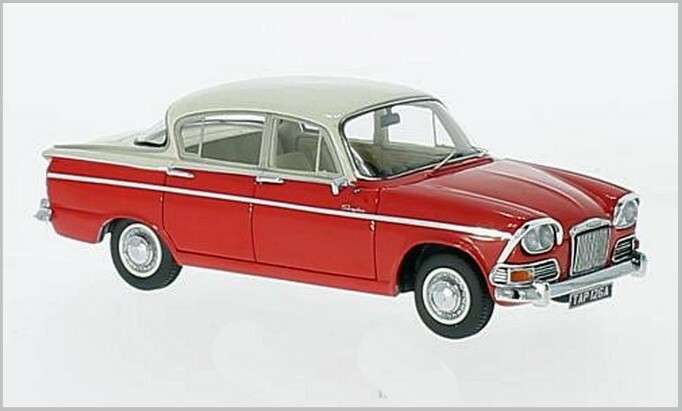 The windscreen is a single part plastic moulding and it may be possible that Oxford intend to model the very rare two door saloon or a coupe as it would just need a different plastic top and interior tub. 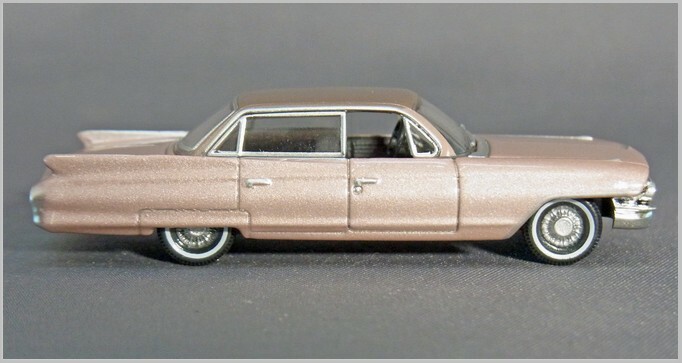 This is based on the second generation of the DeVille. 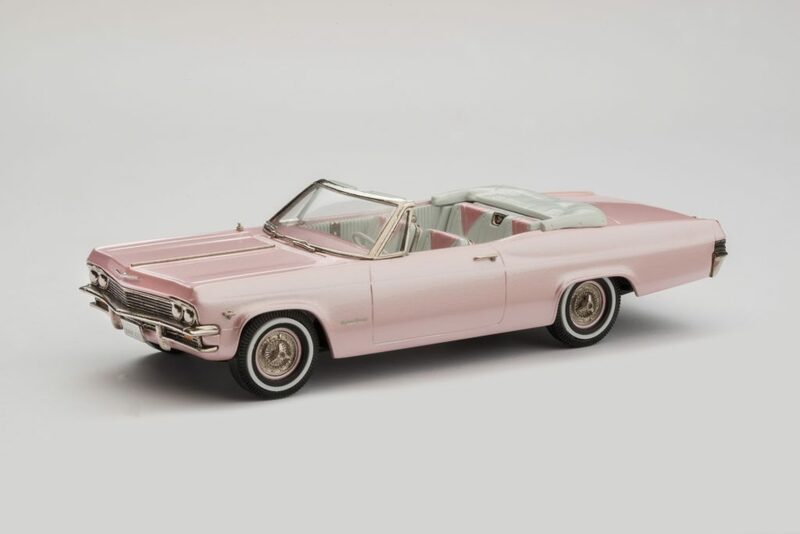 Cadillac restyled and re-engineered the model for 1961. Gone was the wrap around windscreen and the fins were had shrunk. Even the suspension was no longer by air. 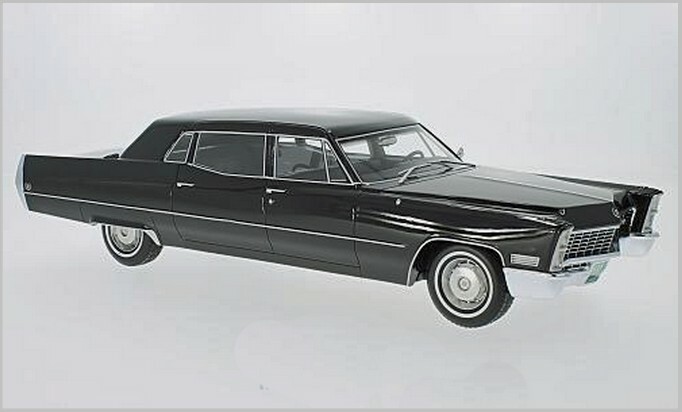 All Cadillac DeVille’s had lots of accessories fitted as standard with power brakes, steering, automatic transmission all coming with every car. 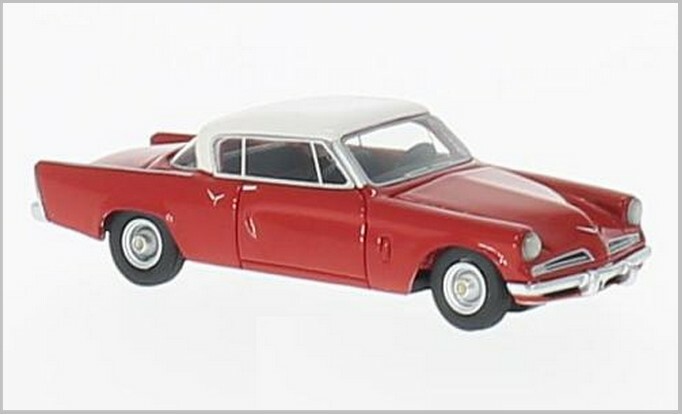 The roof of this car is again moulded in plastic allowing for much thinner chrome printing than is usually seen on small Oxford Models. And of course it allows for flush windows which look the part. 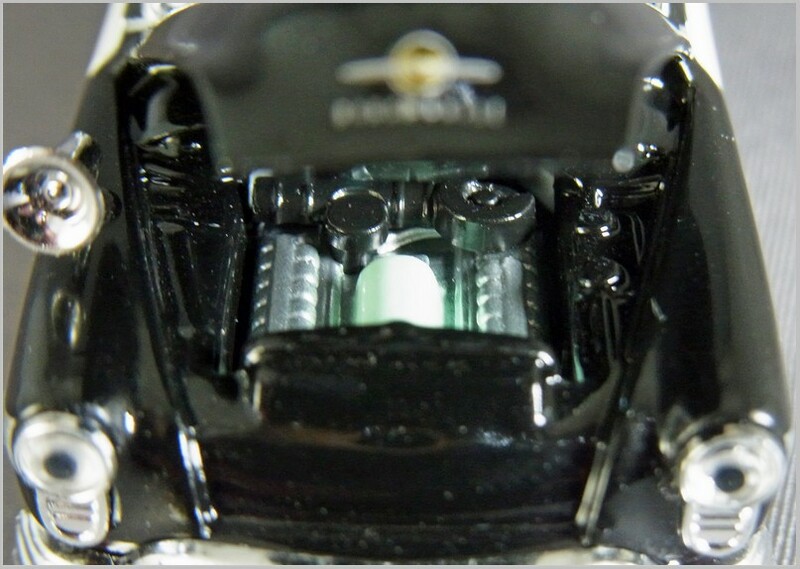 Again fine badges and chrome tampo printing is visible especially when magnified. The small chrome strip with a slight rise to the front on each front wing is modelled and printed. 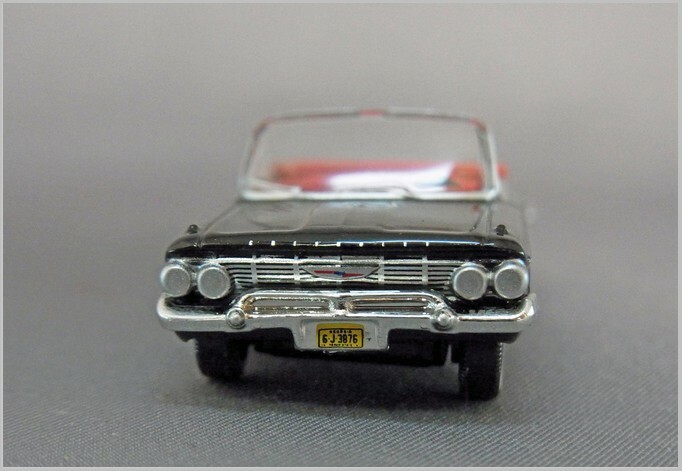 The grille is black washed as was the Chevrolet’s which certainly highlights the fine mouldings. 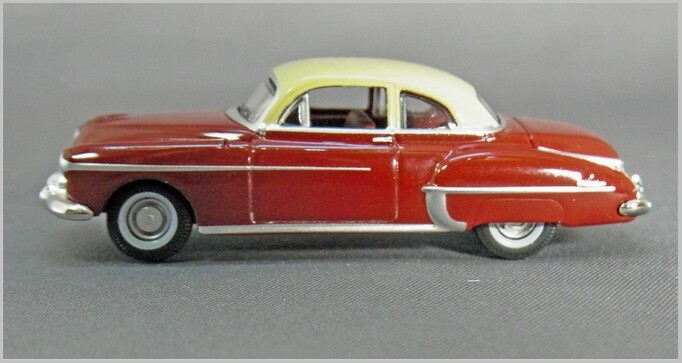 Wheels are neatly represented with a correct thin white wall and the elaborate wheel covers too. 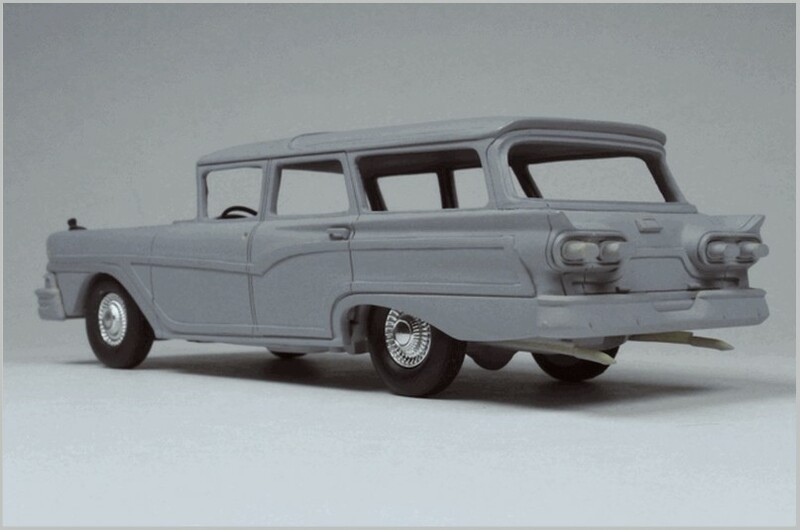 The rear of the vehicle is nicely modelled though the centre section is a bit less crisp than it could be and the printed chrome may extend too high as well. The fins lack the chrome on their end section and on one side mine has a minor casting fault on the inner part of the fin. Not perfect but at this scale it is not immediately obvious either. 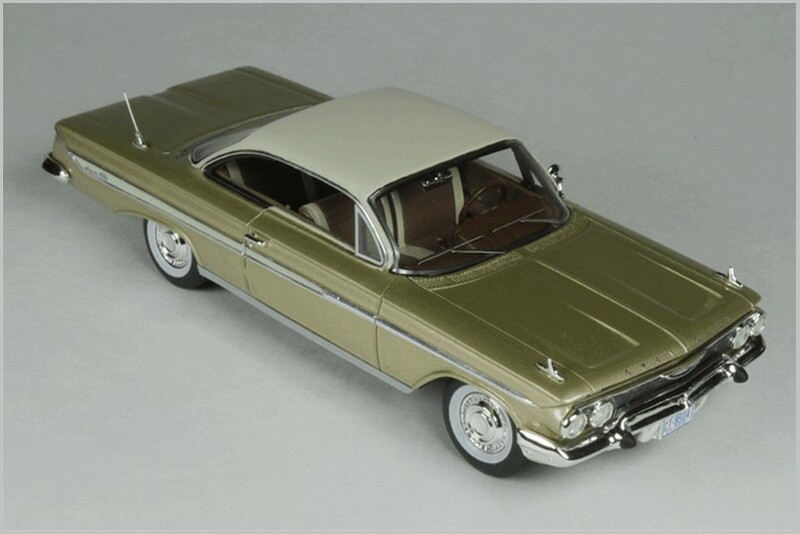 This was third generation of the Bonneville which was Pontiac‘s costliest and most luxurious model throughout the 1960s. The distinctive front end was based on a 1930s design feature and stayed in use throughout the 1960s. 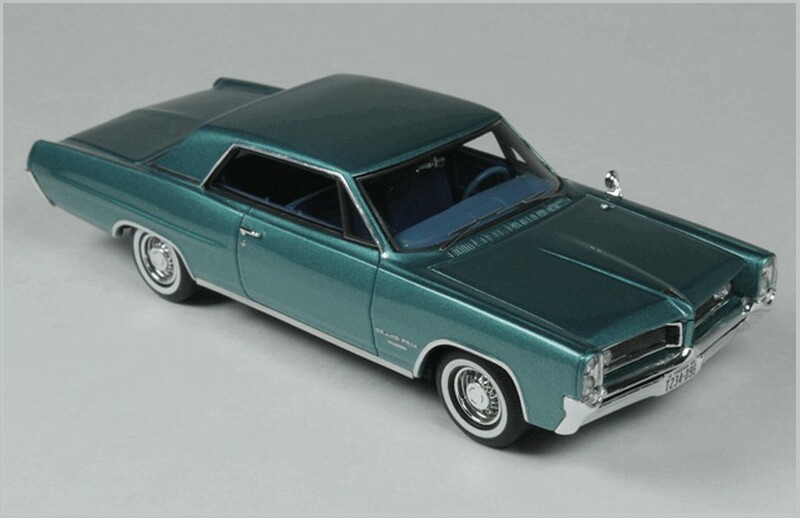 The Bonneville differed from the models lower down in the range like the Catalina and Star Chief counterparts. 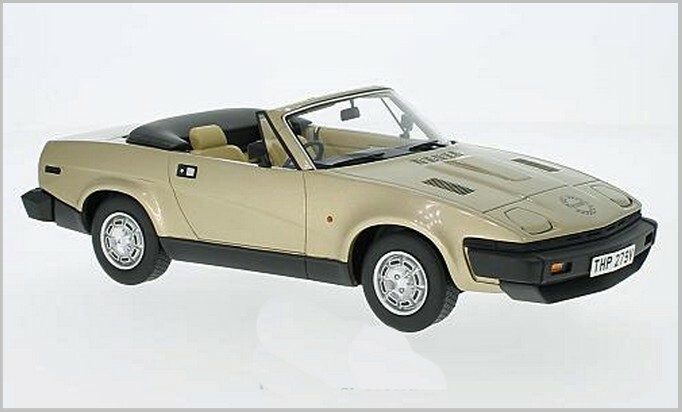 It had luxurious interior trim with upgraded cloth and vinyl, as well as walnut veneer trim on instrument and door panels. 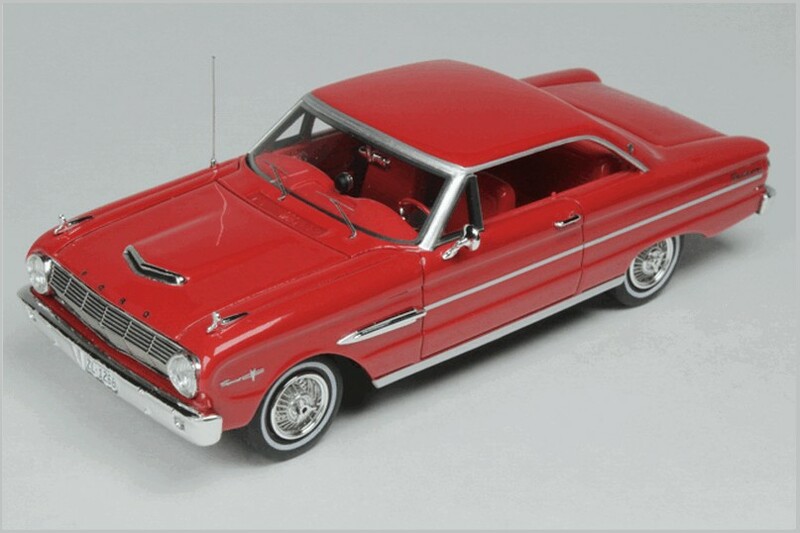 Hydra-Matic gearboxes were standard on the 1961 car but power steering and brakes, and air conditioning were all additional cost options. 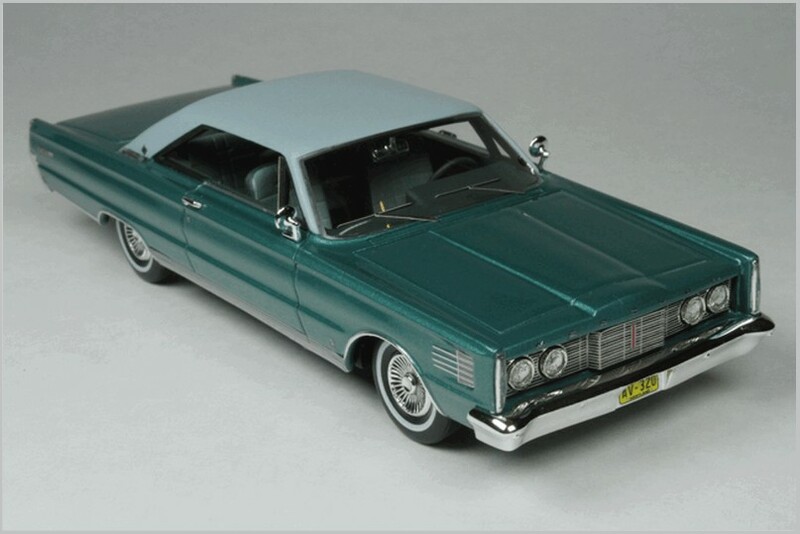 The Bonneville also had more powerful standard V8 engines than other full-sized Pontiacs including the 6.4 litre and 6.6 litre V8s with four-barrel carburetors. 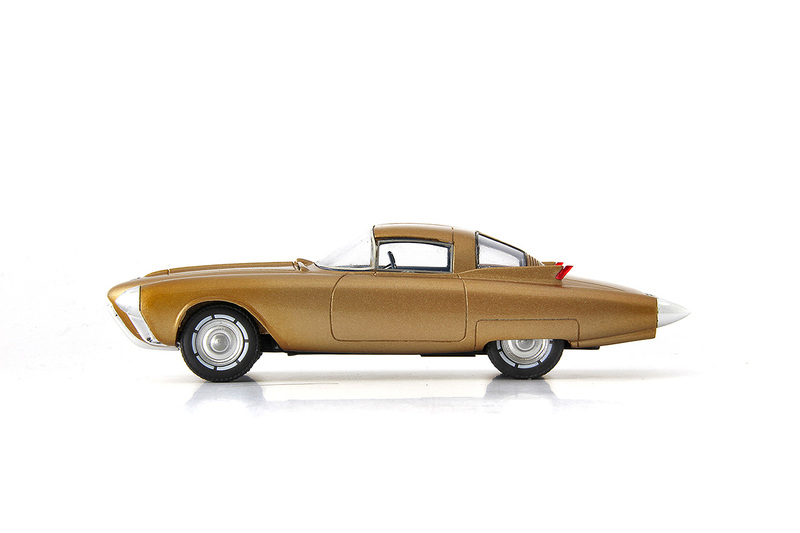 The Oxford model is lovely. The plastic roof with its excellent tampo printing gives he huge windows a really excellent finish. Looking in detail a lot of tiny badging can be seen on the rear wing and at the rear of the front wing. 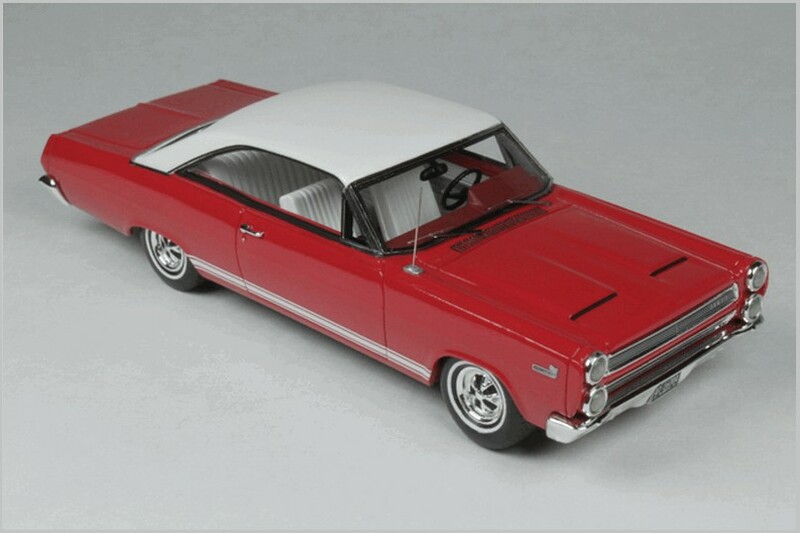 Chrome side features are delicately printed too especially notable are the four chrome features on the rear wing. 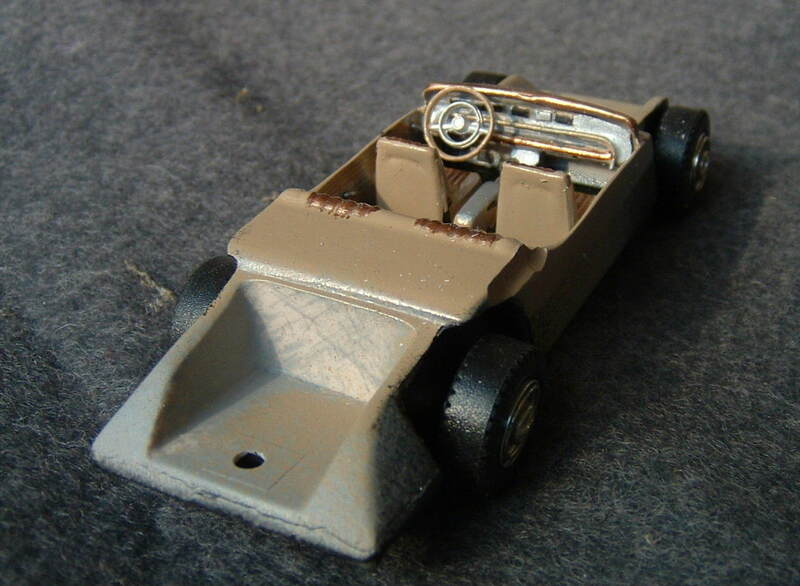 The front wing top chrome with its spear like front edge is also well modelled. 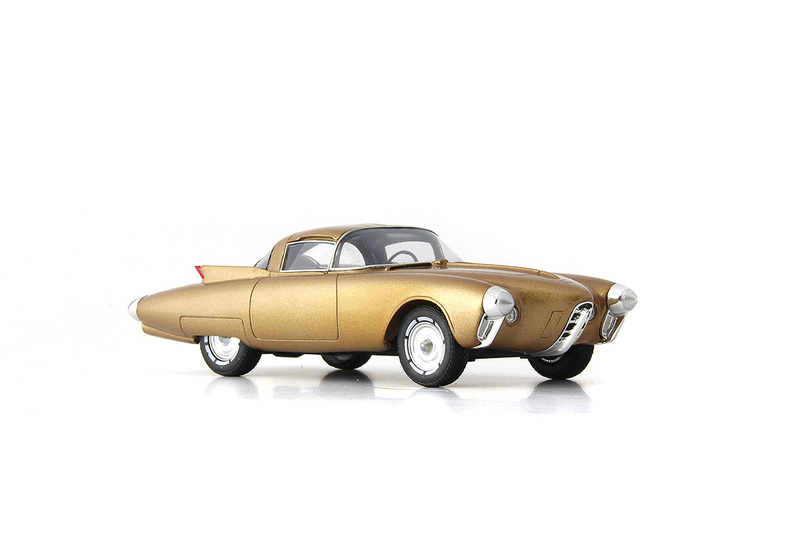 At the rear the delicate modelling of the rear lights and panel are a tribute to the modeller who made the master. And impressively even the boot release button has been printed on the rear panel. 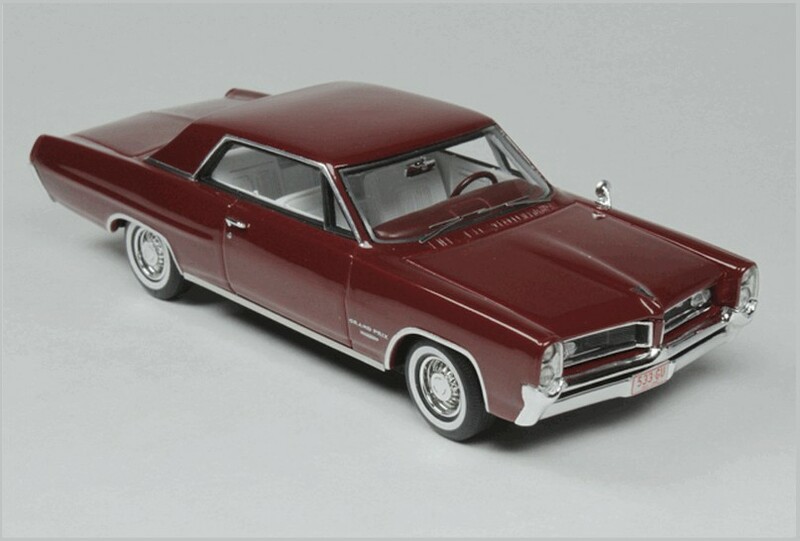 At the front the Pontiac “nose” is beautifully modelled though it would have been nice if Oxford had managed to model the grille or even just print it on. But again this is not a major issue. 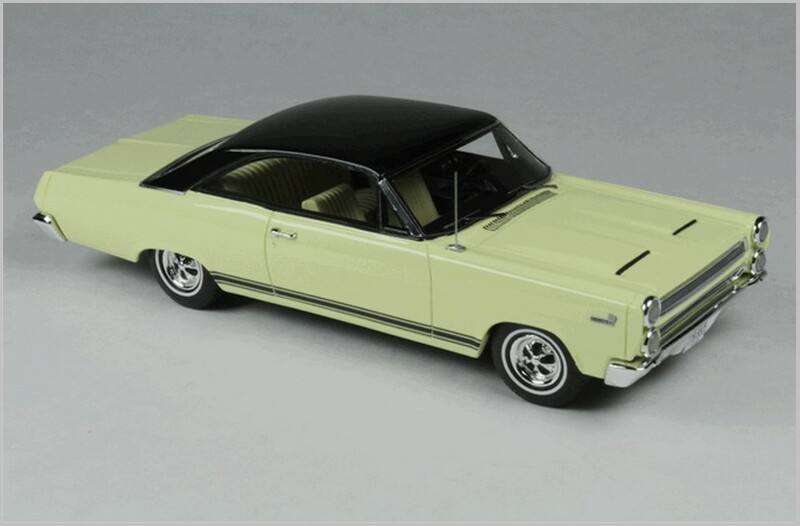 As the roof is plastic it is possible that we will see this car as a convertible at a later date . 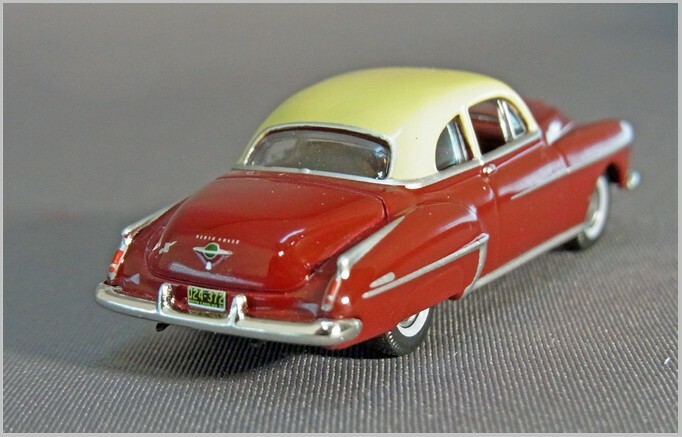 The Rocket 88 was featured in a record by Jackie Brenston and Ike Turner in 1951 which was one of the first Rock and Roll records. 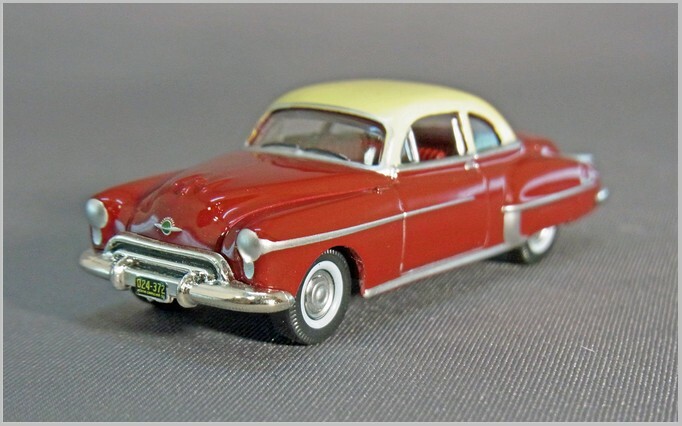 The Oldsmobile 88 was one of the cars that set the style in the early 1950s and was noted for its track performances making it a fashionable car for a type of motorist who would not have bought Oldsmobiles before. 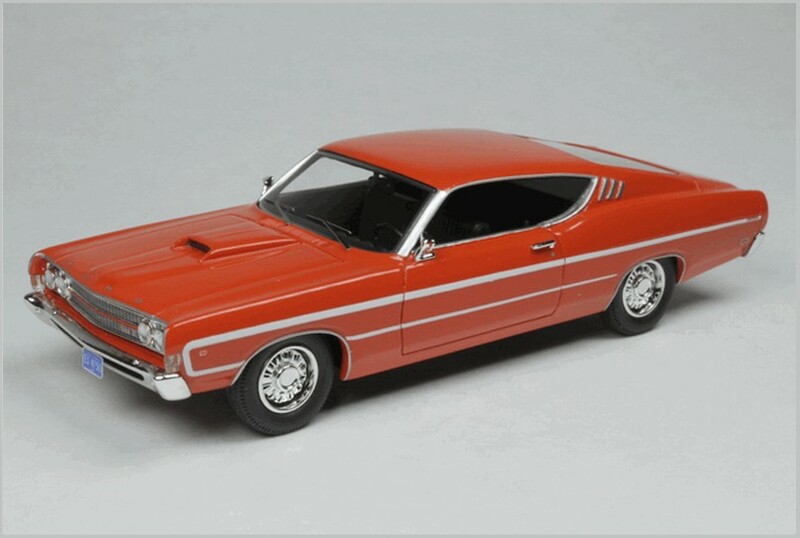 Indeed some suggest that with a small and relatively light body and big powerful V8 it was the first “muscle car“. 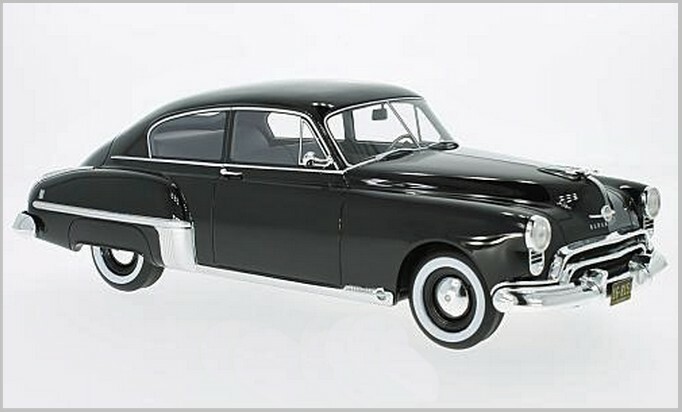 The 1950 model featured a single piece screen for the first time and a Hydra-Matic automatic came as standard unless it was deleted when ordering. 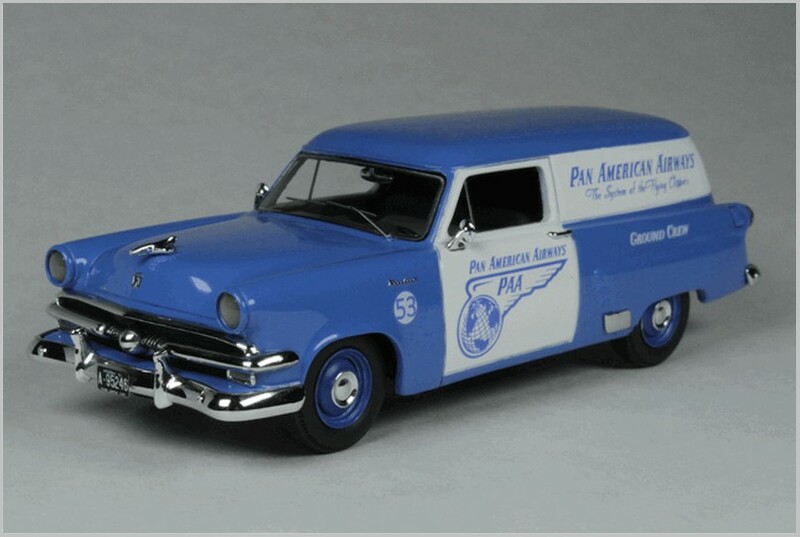 The 88 famously won the 1950 Carrera Panamerica. 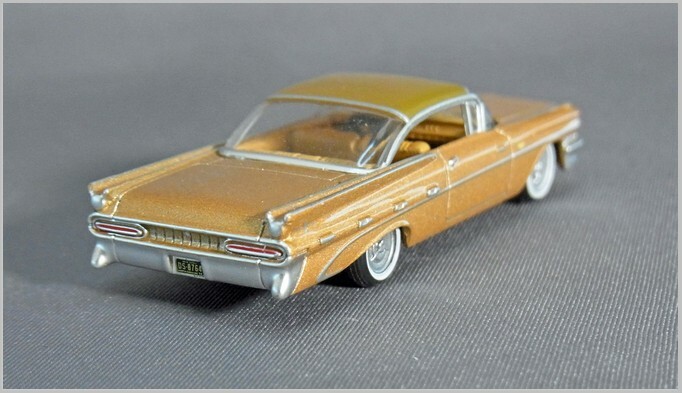 The tampo printing is excellent with tiny badging and lettering evident when looking at enlarged pictures. 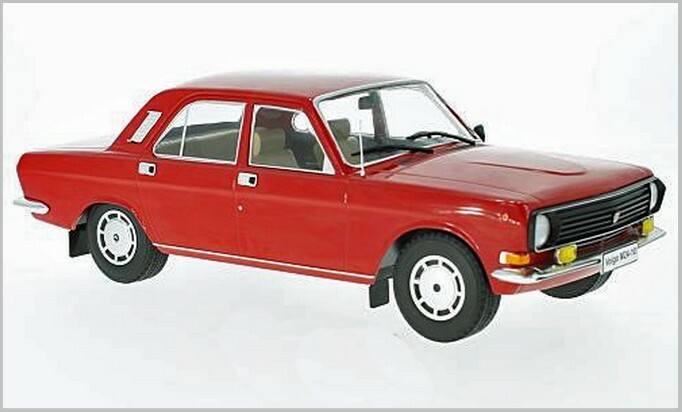 It is a shame that the moulded in bonnet mascot has not been printed too. The wheels and tyres are good with the wider early 50s style white walls and neat chromed wheels finishers and hub caps. 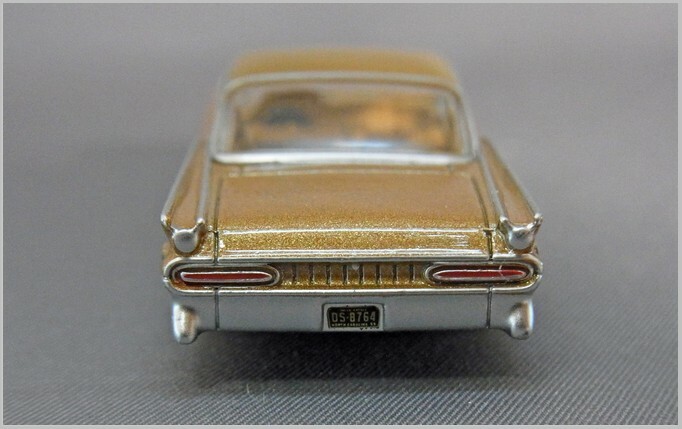 At the rear the Oldsmobile badge and lettering, Rocket 88 symbol , and printed chrome are all well done with simple but effective painted on rear lights. 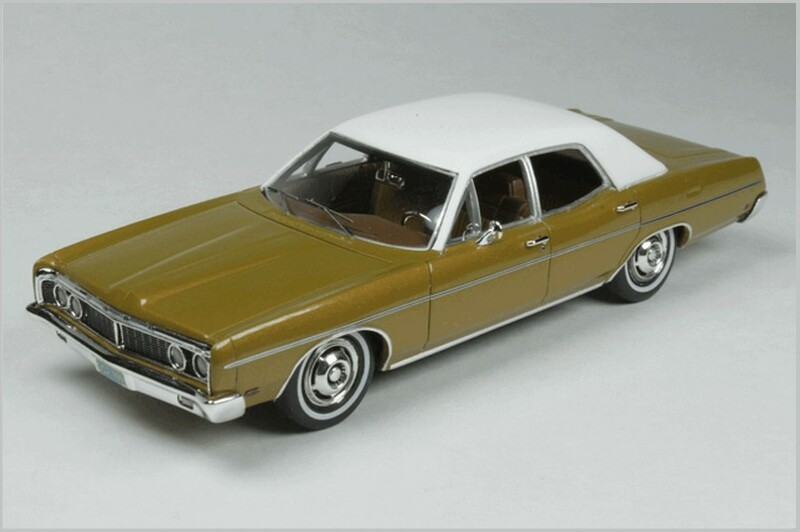 The painted cream roof seems to have rather thick paint which fills the fine shut lines round the upper parts of the doors though later colours for the model may not have the same issue. So Oxford continues to delight me with some releases and frustrate me with others. 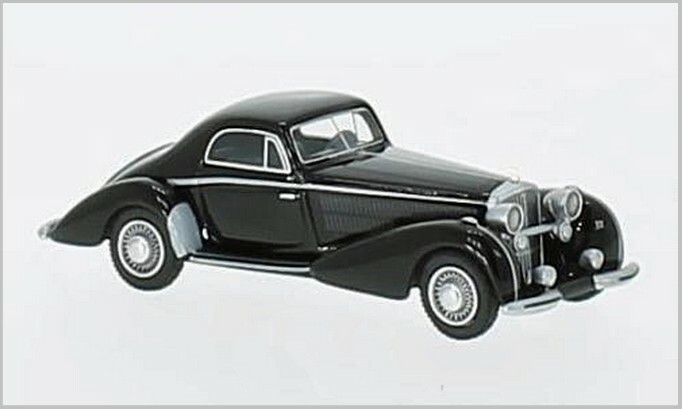 These four new 1:87 scale models may have some flaws but they are well made and finished like the recent 1:76 scale Rolls Royces and I am sure that they will be popular items. 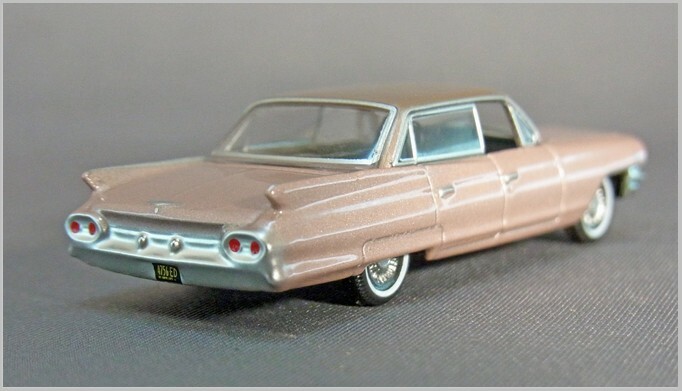 Recently I bought three ME-MOD resin kits of the 1963 Oldsmobile Starfire coupe even though I already had the Brooklin coupe in maroon. 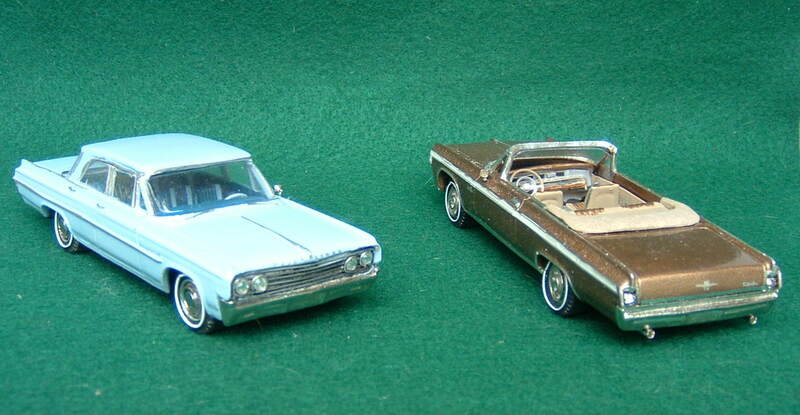 Some will either consider this heresy or craftsmanship but I set about modifying these kits and built three different 1963 Oldsmobiles. 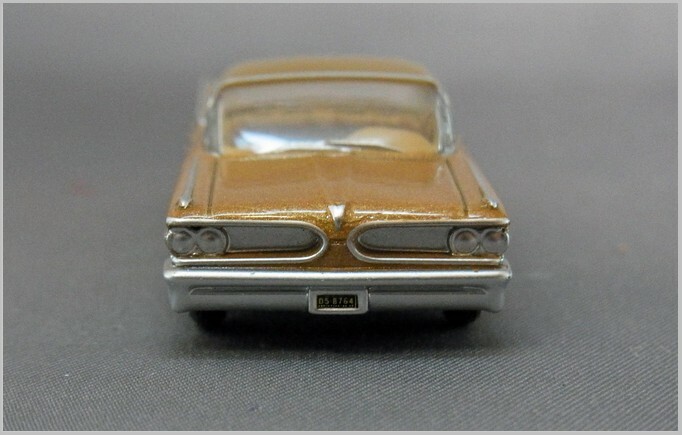 The Starfire was Oldsmobile’s answer to the newly introduced Pontiac Grand Prix but Olds did both a coupe and convertible both with the hottest version of the 394 CID Rocket V8. 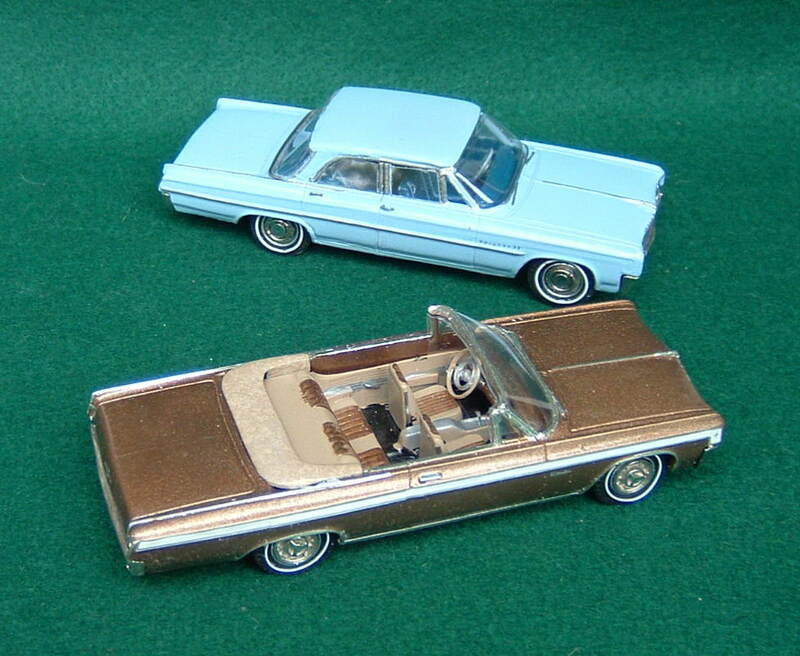 One of the kits became a four door Dynamic 88 sedan, (the entry level full sized Oldsmobile) one became a Starfire convertible, and one became a Super 88 Fiesta station wagon. 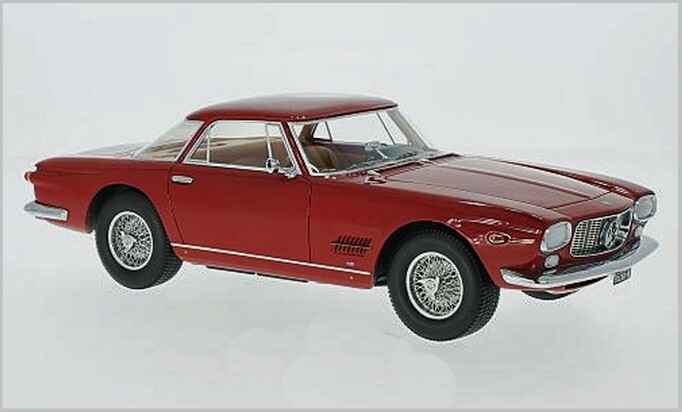 My model collecting and building hobby often includes making models of an actual car that no model maker has done before. 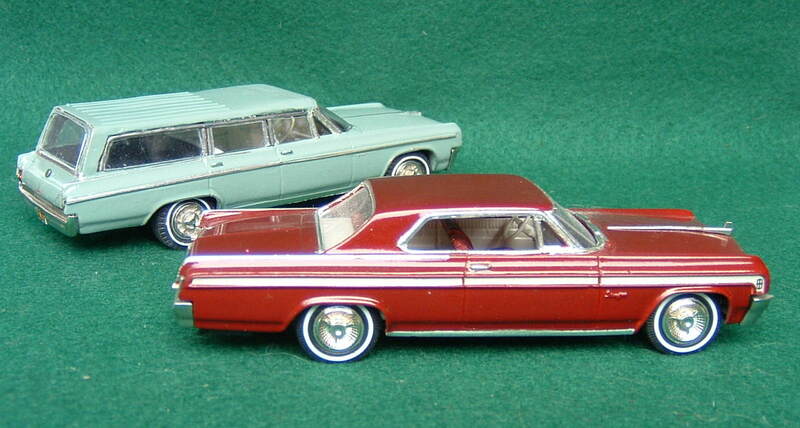 Since I already had the Brooklin Starfire hardtop, I decided to do some different things with the kits. In reworking these I did finish them with somewhat larger tires than the undersized ones in the kits, and added white walls using my technique of applying a thin white painted wire to the tire. 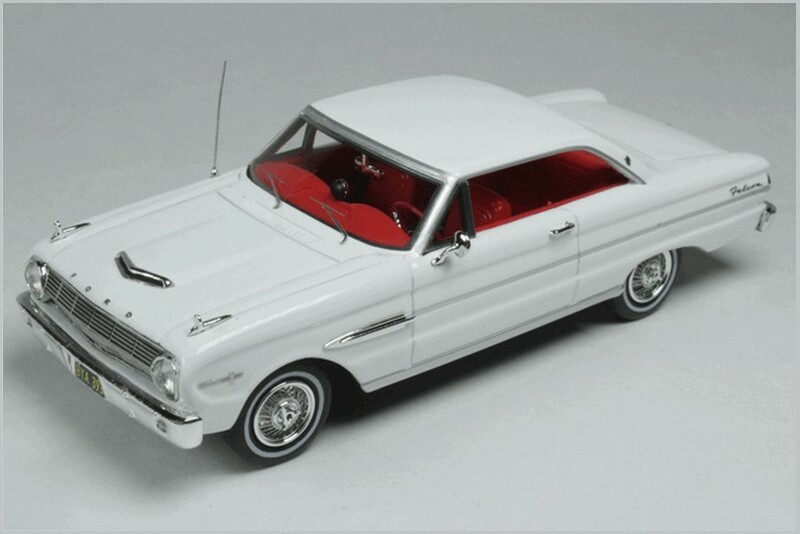 I also changed the dashboards to replicate the actual ’63 Oldsmobile one which I was able to research on Google images. It is amazing the number of photos one can view using this search and these are useful in picking realistic exterior and interior colours as well. And then there is the US car brochure website that is a great resource as well. http://www.lov2xlr8.no/broch1.html. My friend in Norway, Hans Tor Tangerud maintains this amazing resource. 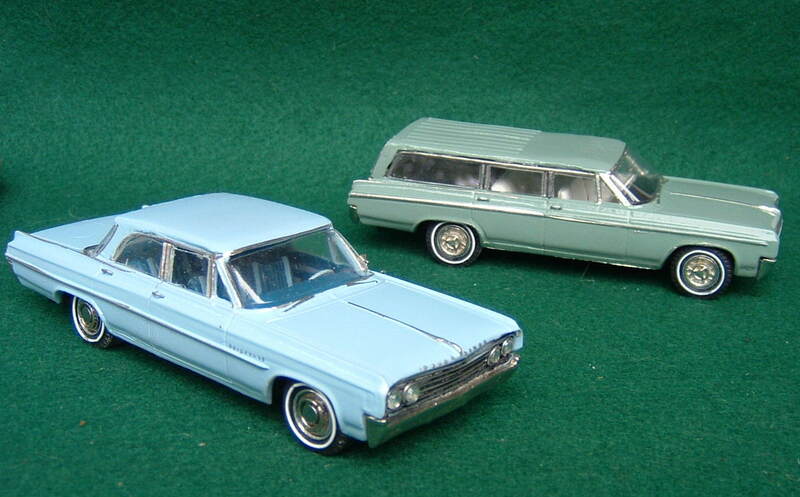 On the sedan I made some wheel covers that were stock on the less fancy versions of this year Oldsmobile. 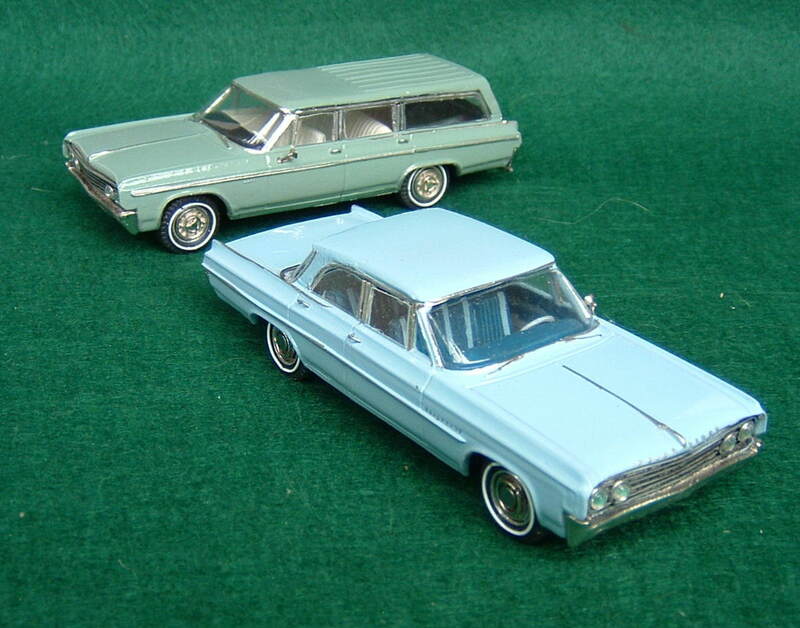 On both the sedan and wagon the front bucket seats had to be connected and the centre console eliminated. Also on both of these the top had to be raised just slightly to accommodate the chrome window frames which were created with thin silver coloured solder. Luckily the vacform windscreen still worked well as making the curved windows is one of the most challenging tasks in these projects. 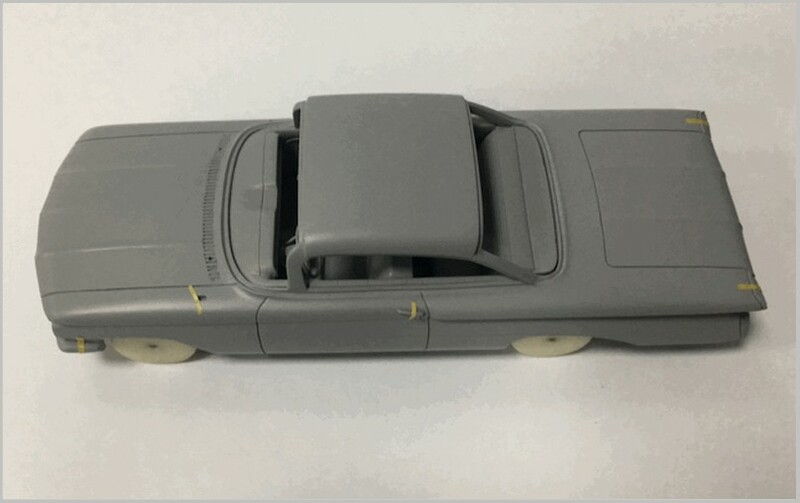 The side mouldings had to be changed to two different versions not used on the Starfire which had a wide silver band for the length of the car. The grills had to be cut off the plated white metal front bumper and a new grill of simple horizontal bars created which I was able to do with silver coloured wire adding jewelled headlamps and headlamp rims. 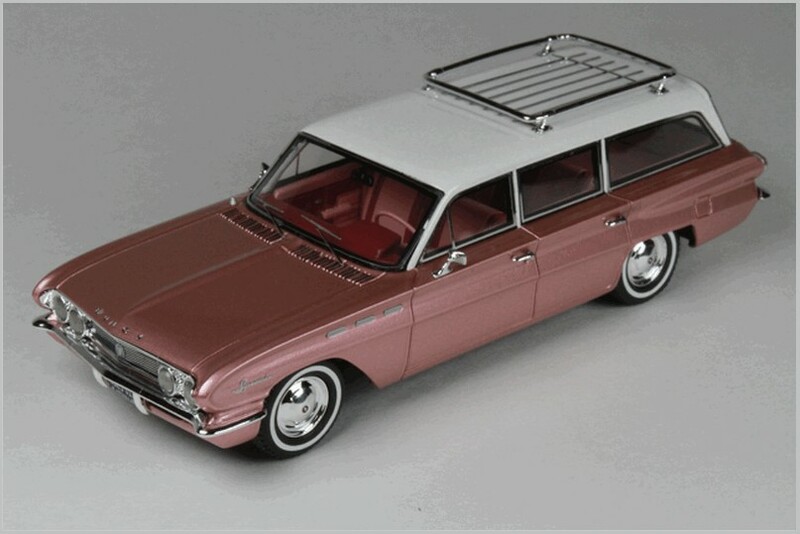 The roof for the wagon was made by joining the displaced roof cut off from the convertible and the load strengthening ribs were added to the rear half. 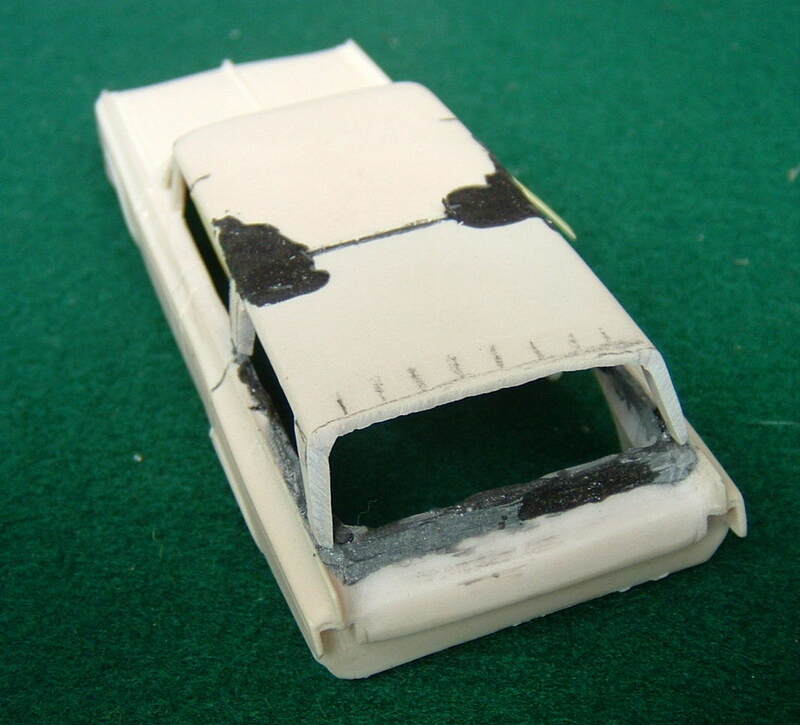 The convertible was the simplest to construct, as only the top had to be cut off and a top boot created but it too got the fascia improvement as well as some small interior handles for the doors and windows made from silver wire. 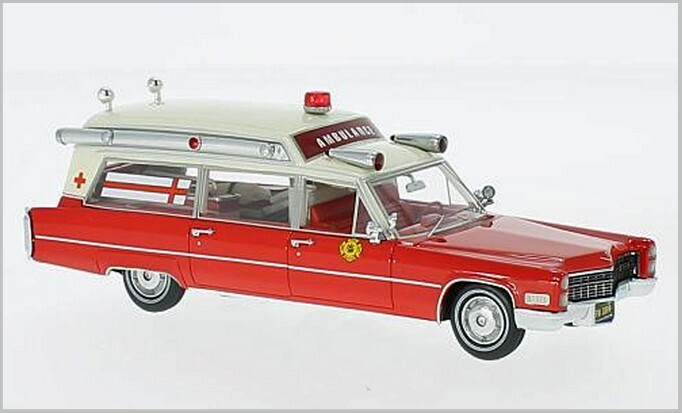 Here is one website I used to study the details of the wagon. 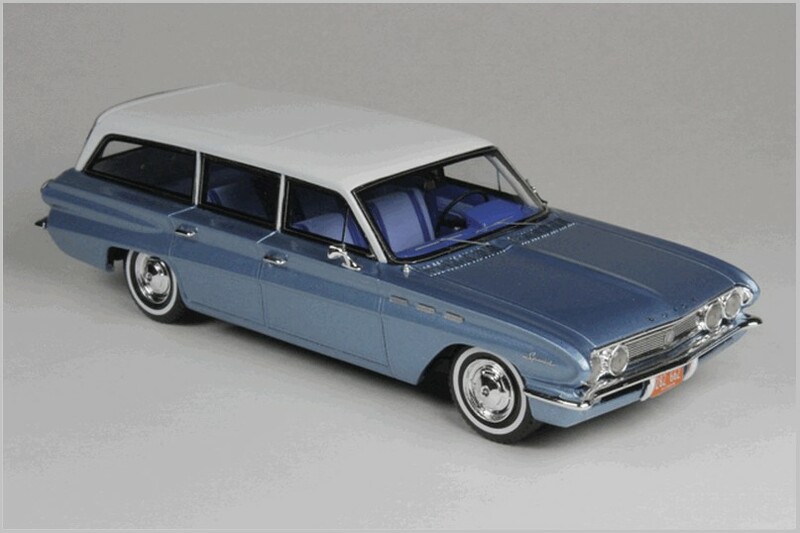 http://americanclassicscars.com/oldsmobile/127461-1963-oldsmobile-super-88-fiesta-wagon.html. I also use my library of books for research on details. 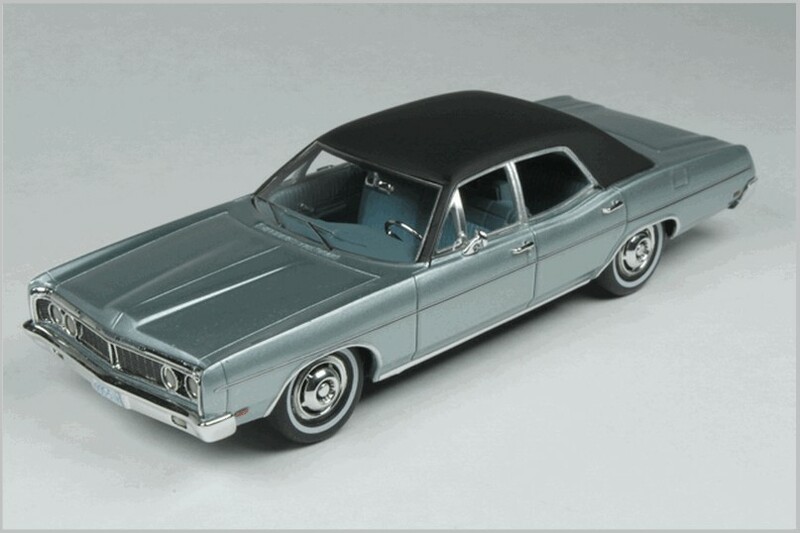 The Crestline series of marque books is exceptionally good as these show at least one photo, usually factory promotional photos, of every model of car for every model year of production. They are, however, in black and white so colour information has to come from elsewhere. 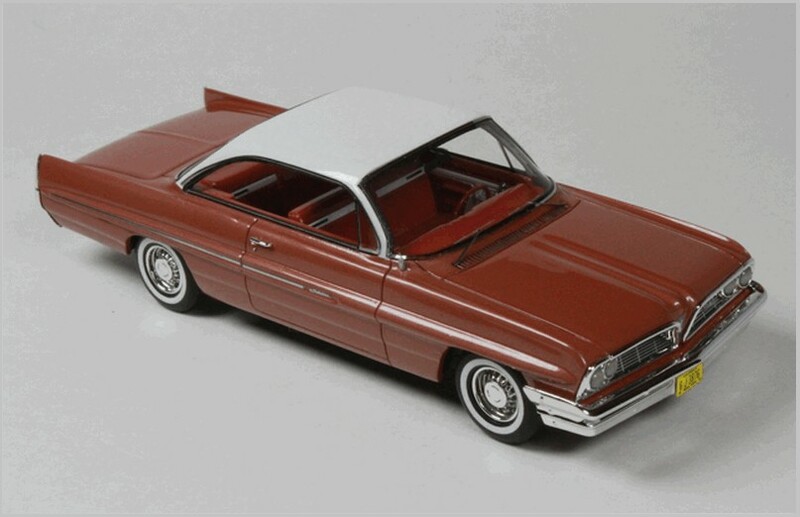 The maroon 1963 Starfire Coupe in the pictures is from Brooklin and gives a good comparison to the Sedan, Convertible and Convertible I have created from the ME-MOD kits.